The 'Kurpfalz', i.e. the region around the cities Mannheim and Heidelberg in Southwest Germany, is located in the Upper Rhine Valley, and blessed with warm climate. 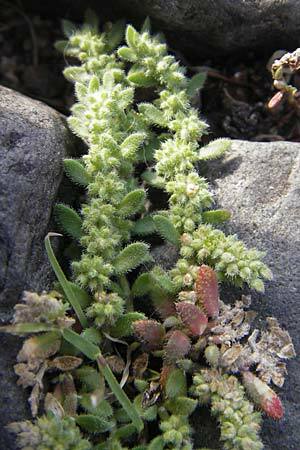 Many neophytic plants have immigrated or been introduced there. 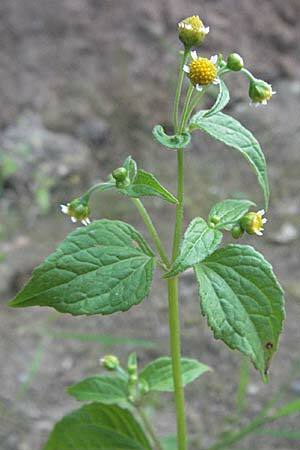 'Neophytic' and 'adventive plants' are wild plants, which were not originally growing there, but immigrated or were introduced since 1492. 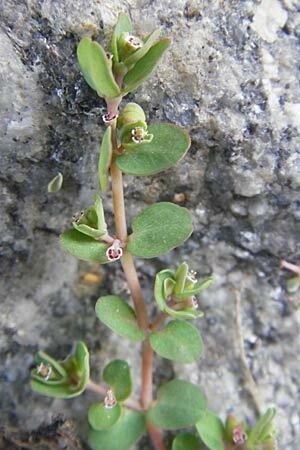 'Neophytic' means those of the immigrated or introduced plants, which are able to adapt to the climatic and other conditions, and last permanently. 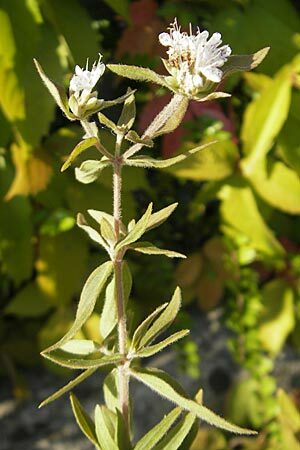 The more general term 'adventive plant' is used for any plant which arrives newly, even if it isn't able to last. Plants which immigrated or have been introduced earlier than 1492 are called 'archaeophytes', but these are not the theme of this page. 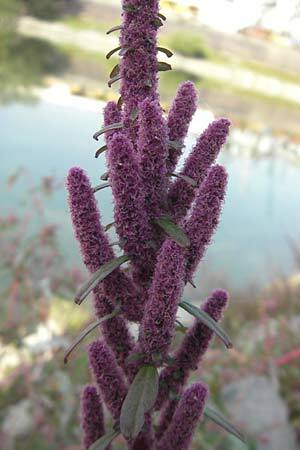 Many of the neophytic plants which are still available today have been introduced from the Mediterranean or other continents by trading ships in the second half of the 19th century, and grew first at river harbors and railway territories. 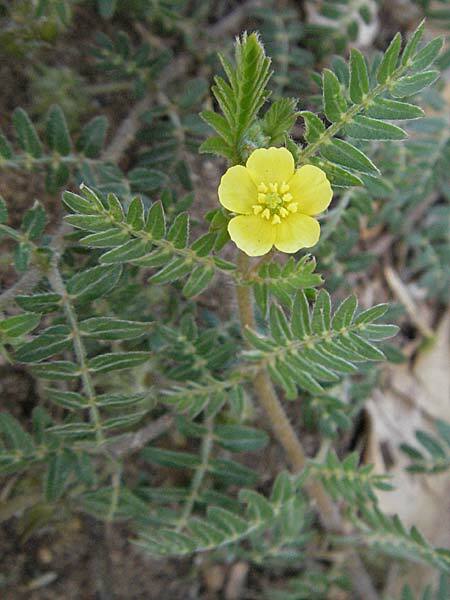 Beneath these neophytic species, which have been introduced without intention, there are others which have been introduced intentionally as ornamental or useful plants, but ran wild later. 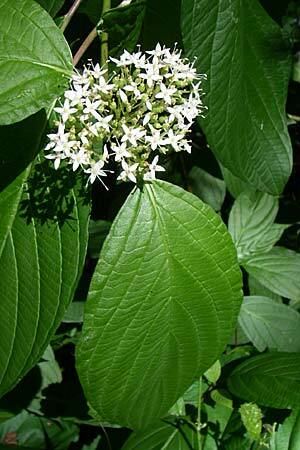 Some of these latter neophytic species cause problems for the native flora, because they oust weaker native plants. At least if this happens in nature reserves, measures have to be taken to protect the native variety of species. 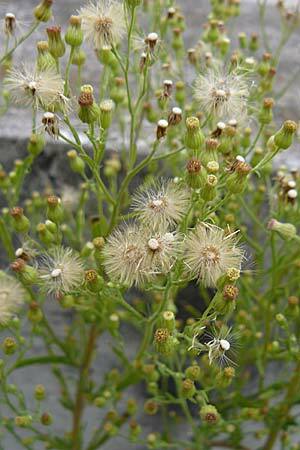 Left: The Stinking Fleabane Dittrichia graveolens has been introduced from the Mediterranean. 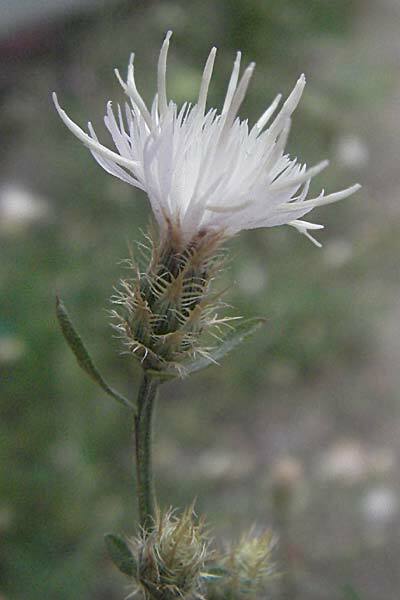 Right: The white flowering Diffuse Knapweed Centaurea diffusa originates from the areas of Eastern Europe and Western Asia. 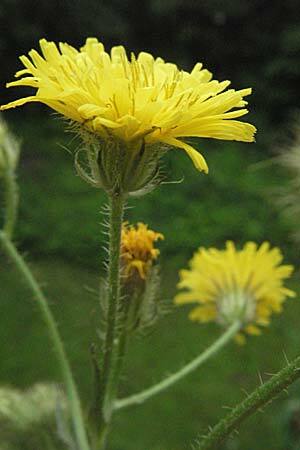 In the regions of Mannheim and Karlsruhe it can today be regarded as naturalized. 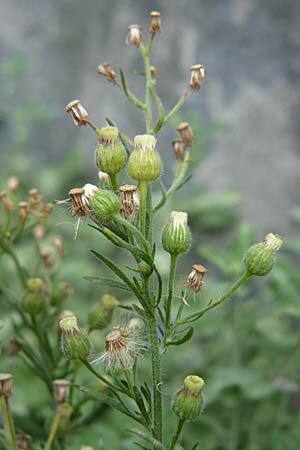 Very similar plants with lilac flowers are usually hybrids with Panicled Knapweed Centaurea stoebe. 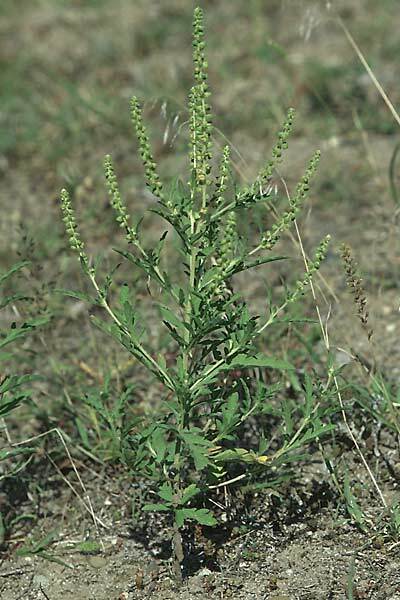 Row below: Both the Ragweed Ambrosia artemisiifolia, which has fallen into disrepute due to its allergy-producing pollen, and the smaller Perennial Ragweed Ambrosia coronopifolia, originate from North America, as well as the tall Giant Ragweed Ambrosia trifida. The latter has become very rare in Mannheim, only in 2011 I managed to find one at the industrial port. 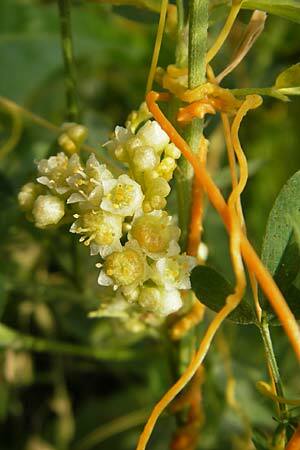 These plants have many male blooms, whose pollen the wind carries to the few and small female blooms. Left: Of the Marsh Elder Iva xanthiifolia, which has been introduced from North America, I still know only one current site at Viernheim. 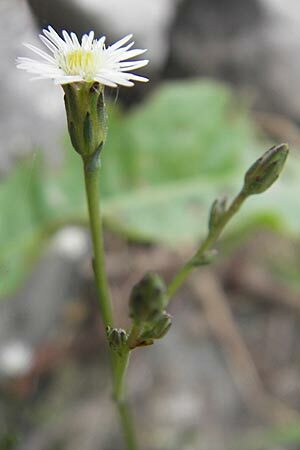 Its propagation works similar to that of the Ambrosia species. 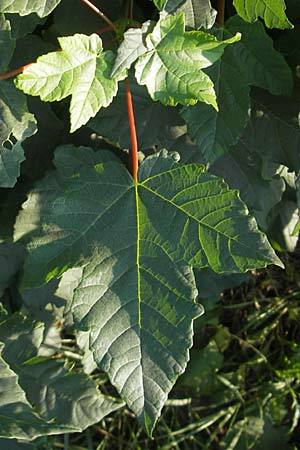 The leaves show a remarkable similarity with those of the Cockleburs, on which the latin name is pointing. 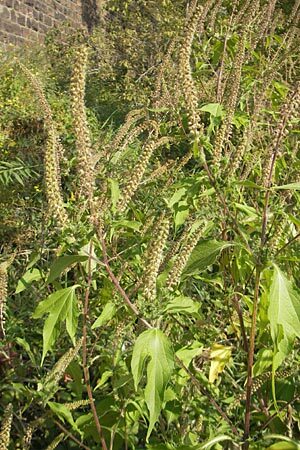 Right: The Riverside Cocklebur Xanthium albinum shall have developed in Europe from species, which had been introduced from America ! 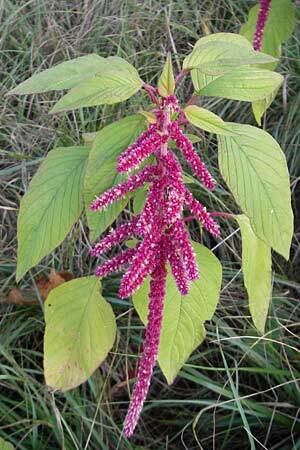 In the region of Mannheim it can be regarded as naturalized. 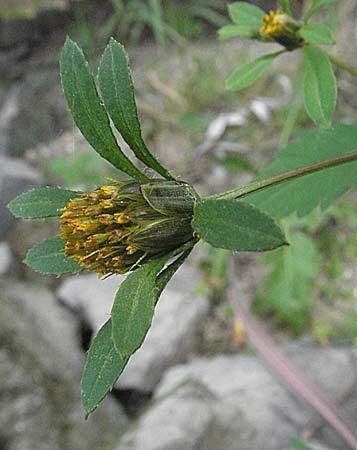 Above: Devil's Beggartick Bidens frondosa originates from North America. 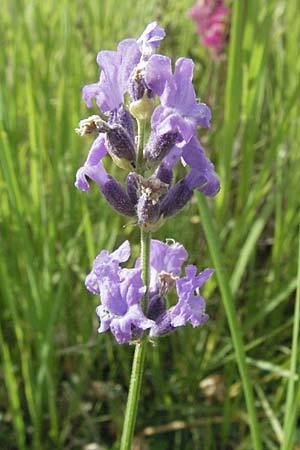 It likes damp places, and is naturalized and not rare along the big rivers Rhine and Neckar. 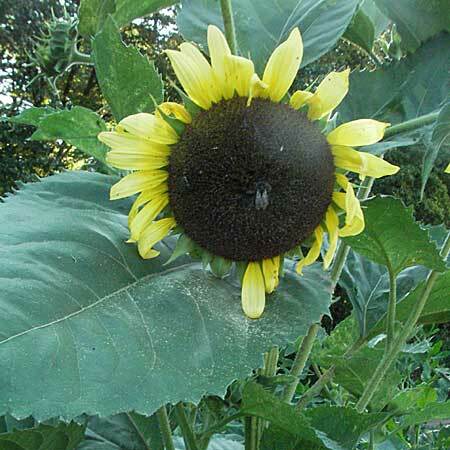 Above: Again and again the Sunflower which originates from America runs wild from birdseed, but ist doesn't establish itself steady. 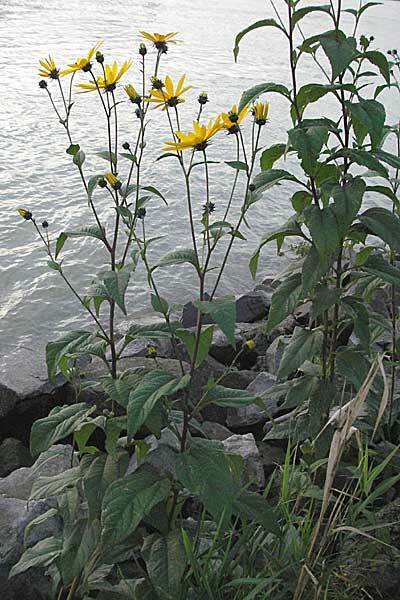 Right: The Jerusalem Artichoke Helianthus tuberosus, which has formerly been cultivated as 'Sweet Potato', has run wild mainly along the big rivers. 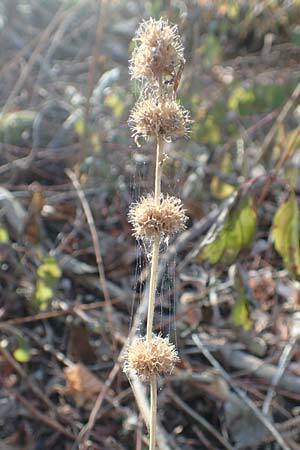 It has been introduced from North America. 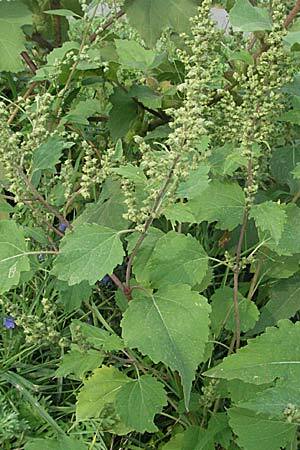 Right: Since the 19th century the two 'Soldiers' Galinsoga ciliata and Galinsoga parviflora are spreading in Southern Germany. 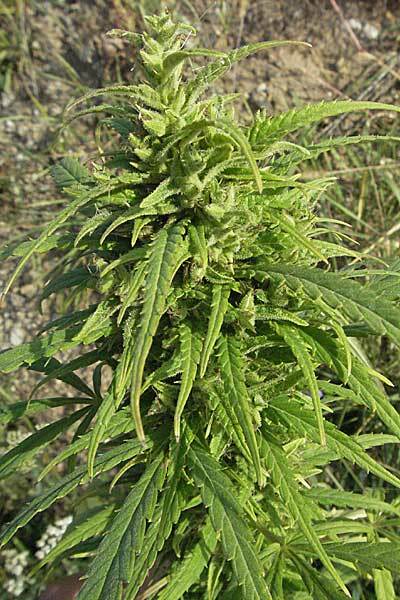 Since in those times Germany and France were enimies, and the plants arrived from Western direction, one of their German names could be translated as "French Weed". But in reality they originate from the South American Andes. 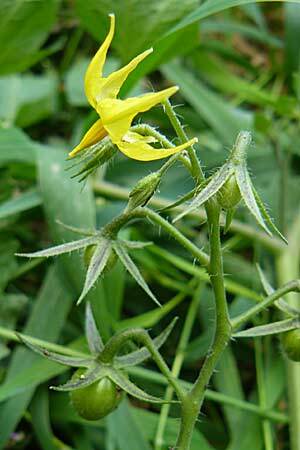 Left: Niger Guizotia abyssinica is an important useful plant in Africa, where its seed is eaten. I found it at Mannheim on a soil depot and also in front of a shop for animal aliment. 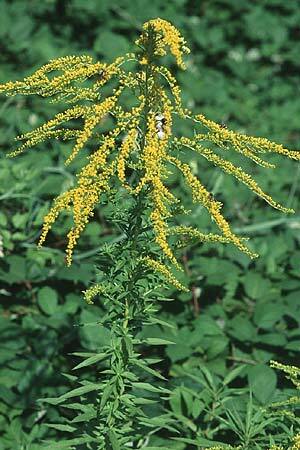 Below and right: Naturally also the wide-spread large Goldenrods Solidago canadensis and Solidago gigantea are available in the 'Kurpfalz' region, introduced from North America. 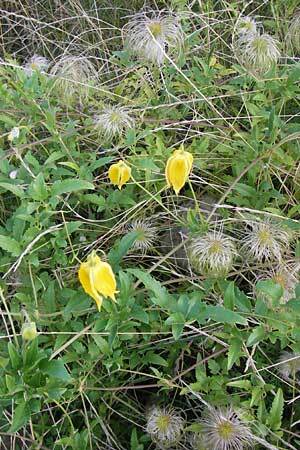 In suitable biotopes they are going to displace the native flora, since they have few natural enemies. 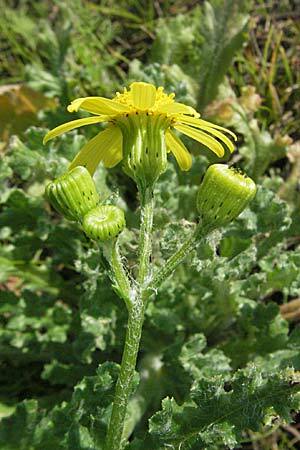 Bottom: The Eastern Groundsel Senecio vernalis originates from the sand steppes of South-East Europe and Western Asia, and reached Central Europe in the 19th century. 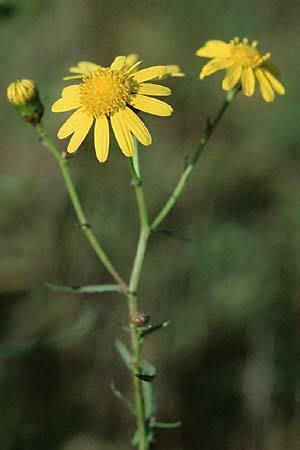 Bottom: There are many native Ragworts and Groundsels, but the Narrow-Leaved Ragwort Senecio inaequidens originates from South Africa. Via stopovers in the Mediterranean where it had already been introduced in the 40's of the 20th century, it arrived in Central Europe in the 80's. 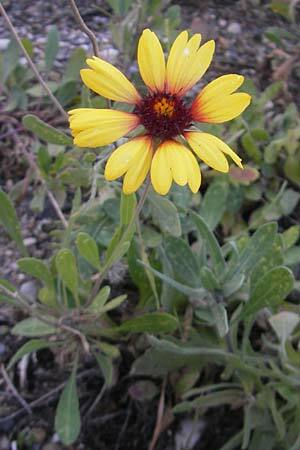 Bottom: The Common Blanket Flower Gaillardia aristata which seems to have escaped from a flower bed has run wild in the Rhine port of Ludwigshafen and reproduces steadily. 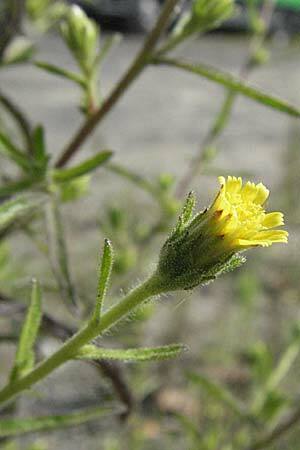 Left: The Bristly Hawk's-Beard Crepis setosa is not rare on the sandy soils of the Rhein-Neckar region. 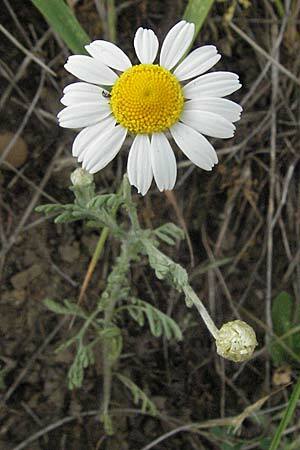 It originates from the Eastern Mediterranean. 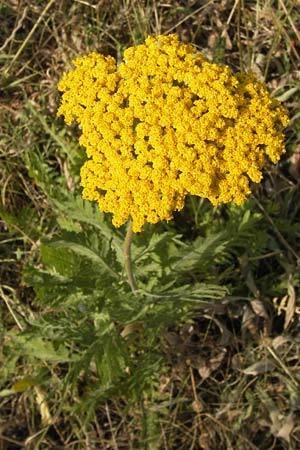 Left: Fernleaf Yarrow Achillea filipendulina which originates from Caucasus has spread at Mannheim from a planting to adjacent marginal strips and pavement gaps. 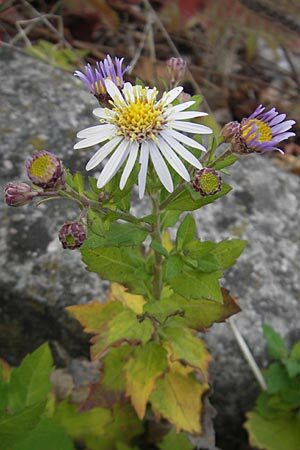 Right: The Mexican Fleabane Erigeron karvinskianus, a plant coming from Mexico, grows in a court in the city of Mannheim. 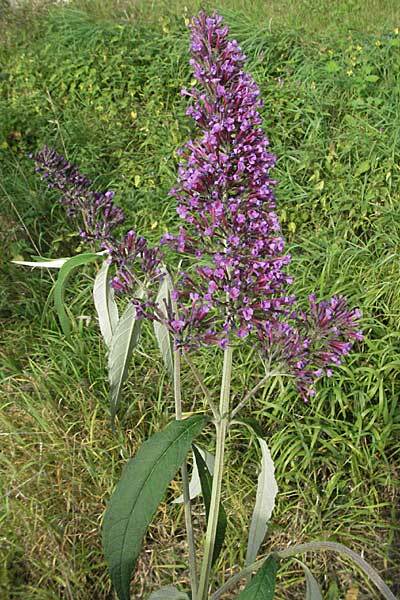 In Ludwigshafen Conyza albida can be found beneath Conyza bonariensis. Both originate from South America. 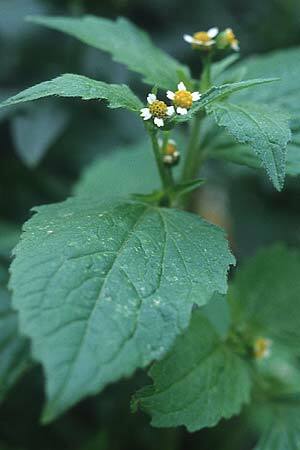 The plants of the next row originate from North America. 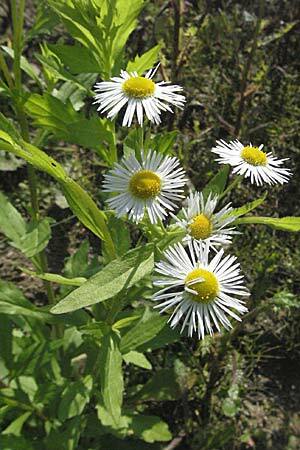 The distribution of the American Daisies mainly along the big rivers and the determination of their exact species aren't well investigated yet, not only in the 'Kurpfalz'. Of several closely related species occurring here only two examples are shown in the left and middle photos below. 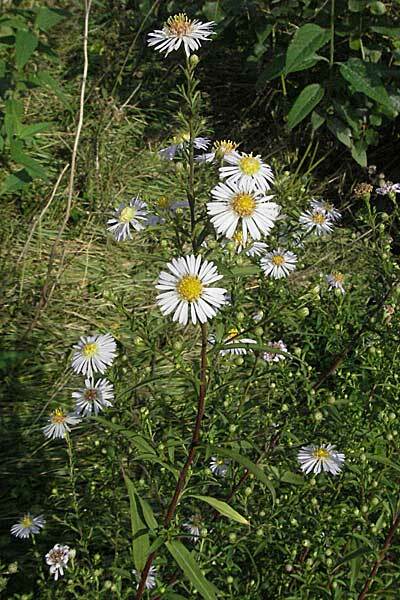 The Canadian Fleabane Conyza canadensis (top right) and the Tall Fleabane Erigeron annuus (bottom right) are both wide spread and available in extremely big numbers. 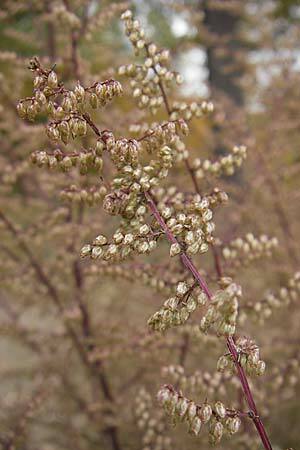 Top middle: From the Balcans to Asia occurs the Redstem Wormwood Artemisia scoparia. 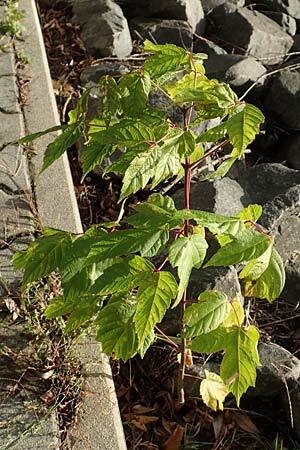 At a soil depot near Viernheim a strong plant was growing in 2008 which unfortunately I saw only in faded state. 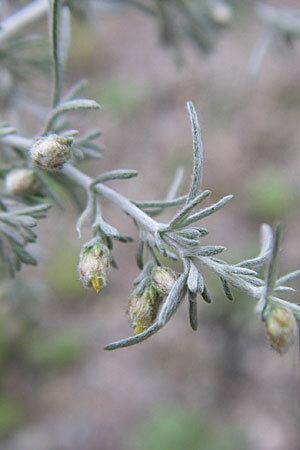 Top left: The Austrian Wormwood Artemisia austriaca originates from the steppes of Eastern Europe and Asia. 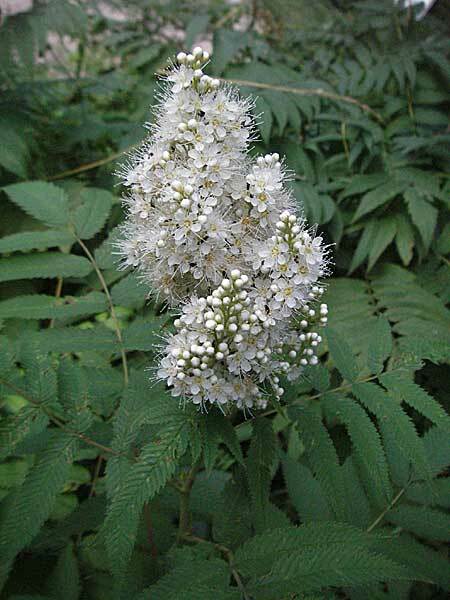 It can be found in the nature reserve Pferdstriebdüne near Sandhausen. Top right: Also from South-East Europe and Western Asia comes the bright green, smelling Annual Wormwood Artemisia annua. 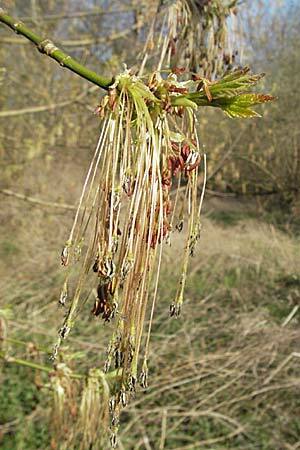 In 2011 one stem was growing at a soil depot in the North of Mannheim. 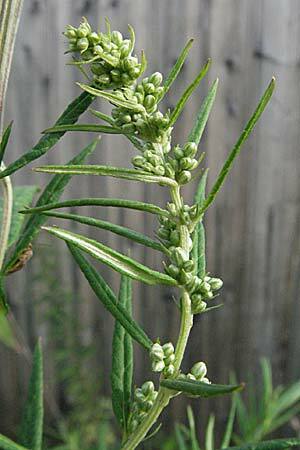 Left: The Chinese Mugwort Artemisia verlotiorum has been introduced from East Asia with other plants. The sites in Heidelberg, which I know, are on waste land. 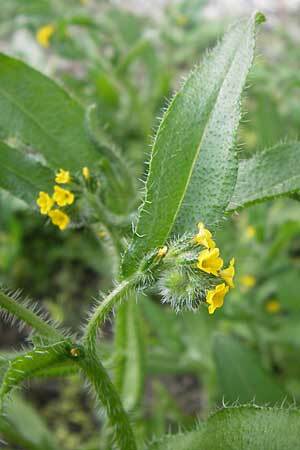 But for the farmers of the Bodensee island of Reichenau it turned out as a serious weed. 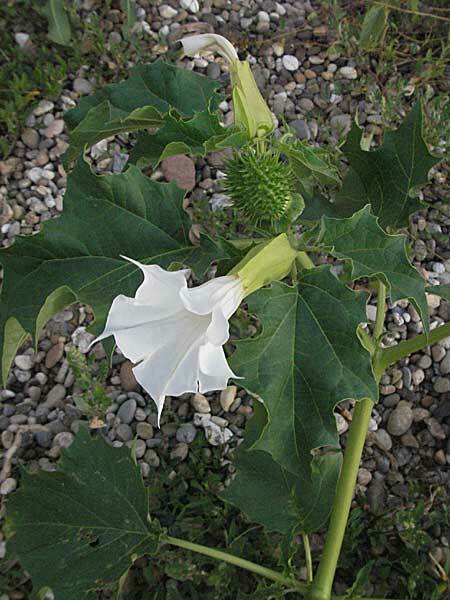 Both Thorn Apple Datura stramonium (right) from Central America and the China Tea-Plant Lycium chinense (left) from China are attractive plants of the Nightshade family, which were imported as garden plants. 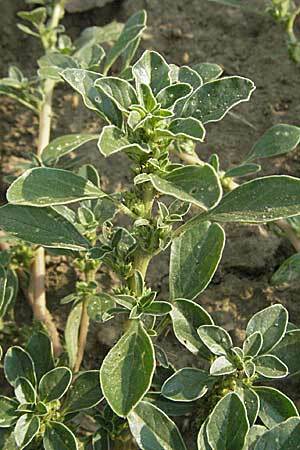 The similar Duke of Argyll's Tea-Plant Lycium barbarum has been planted at road sides in big amounts in order to fix the soil. Die Blüten, obwohl ebenfalls weiß, sind auch etwas unterschiedlich. Ich fand ihn als Unterwuchs in einem Maisfeld und auf sandigem Ödland. 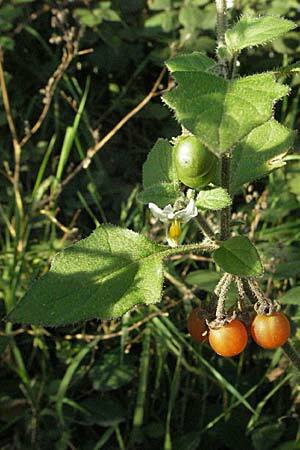 The Ground-Cherry Nightshade Solanum physalifolium which is shown on the right below photo, and which is available near St.Leon, differs from the native Black Nightshade by stronger pilosity, bright green leaves, and glossy green berries with bigger petals. 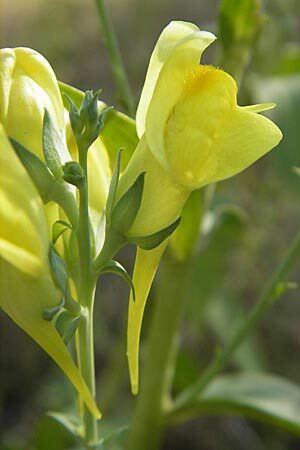 I found it in a maize field and on sandy wasteland. 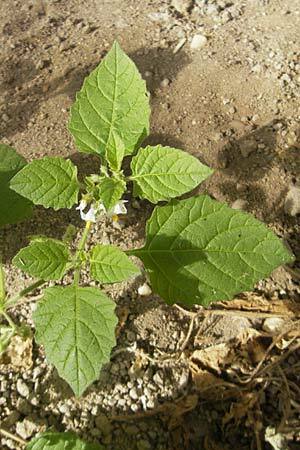 The Saracha Nightshade Solanum sarachoides from South America on the photo below has longer petals around the green berries, sticky pilosity and an unpleasant smell. 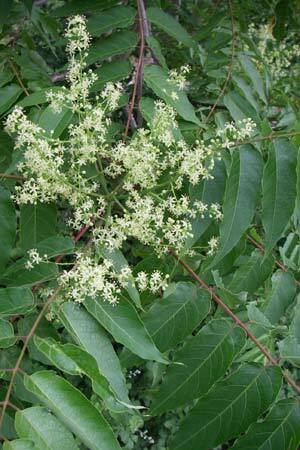 I found the Saracha Nightshade at several sites in Mannheim. 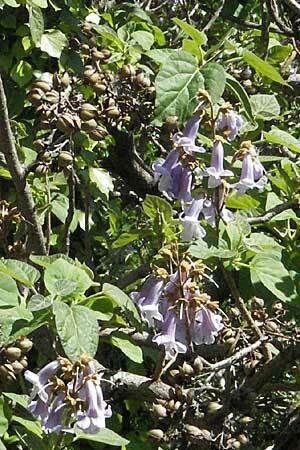 Above: The Wooly Nightshade Solanum villosum, has bright red berries and a strong pilosity. It came from South America and was found in Heidelberg. In the past it had been mentioned for several locations in the region, but usually it stayed only few years as long as the soil was open. 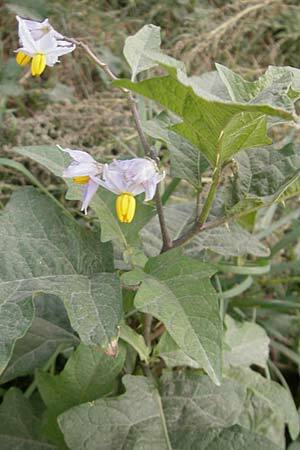 Right: The Sticky Nightshade Solanum sisymbrifolium has eatable red fruits. 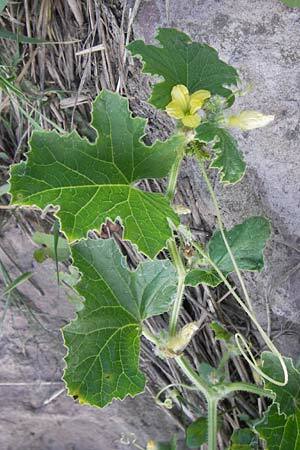 Nevertheless it is not well known, because it's not very suitable for cash cropping, since the whole plant including the rips of the leaves is very spiny including the rips of the leaves. 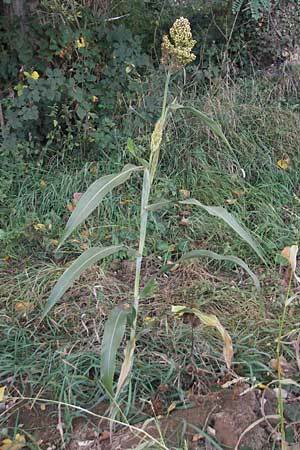 After the floodwater 2013 I found one stem of the South American plant at the bank of the Neckar near Mannheim. 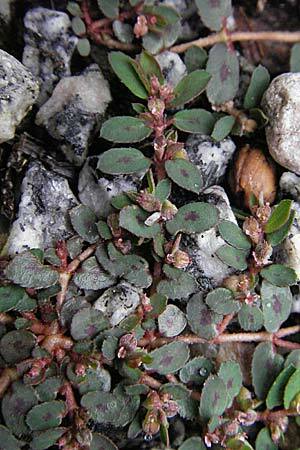 Here the Spotted Spurge Chamaesyce maculata grows mainly on the gravel paths of cemeteries. 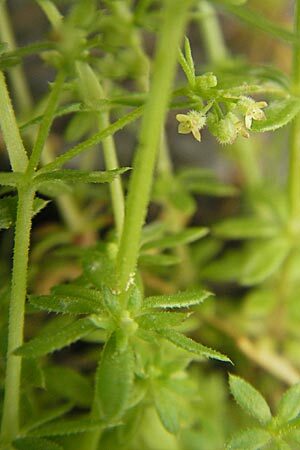 It is a small plant, its leaves are only 5 to 9 mm long. Its origin is North America. 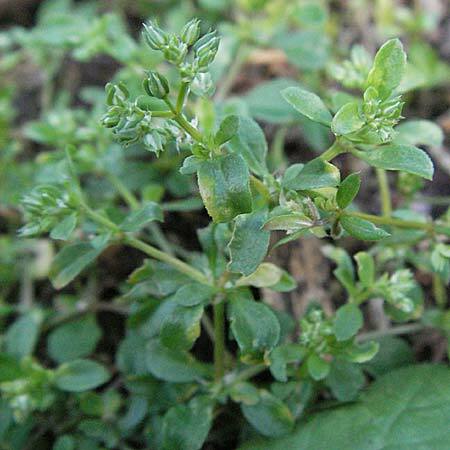 Similar is the Trailing Spurge Chamaesyce humifusa. 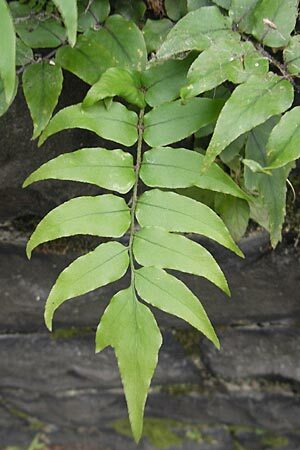 Its leaves have no dark spot. It was imported from Asia. There is a site of it at the Rhine port of Ludwigshafen. In the city of Heidelberg you can find a third species, the Matted Sandmat Chamaesyce serpens which comes from America. 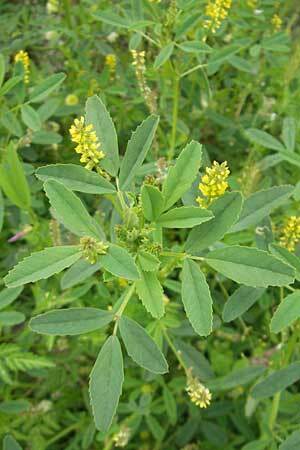 Left: The Caper Spurge Euphorbia lathyris originates from Asia and the Mediterranean. 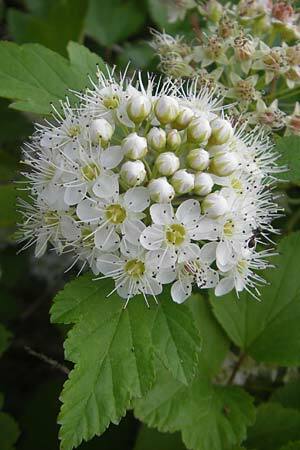 Because it is said that it drives voles and moles away, it is grown in gardens, from where it often runs wild. 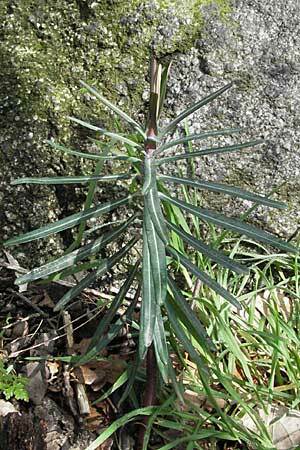 Right: The Variegated Spurge Euphorbia marginata which reproduced on a soil depot near Mannheim has been introduced from Mexico. 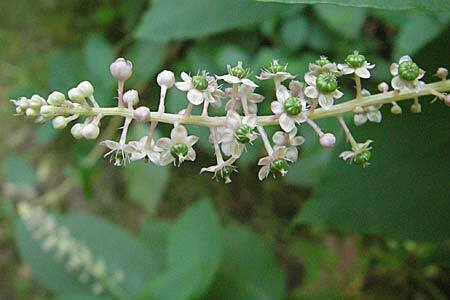 The Pokeberry Phytolacca americana whose origin from North America can already be seen in its latin name, has a horizontal inflorescense, but later the heavier fruit hangs downward. 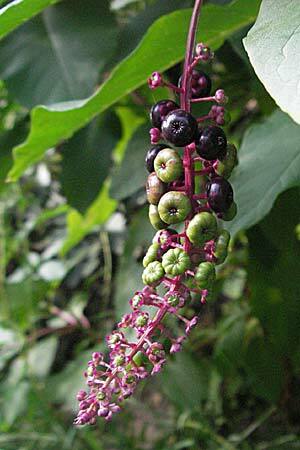 In contrast to that the Pokeweed Phytolacca esculenta, whose inflorescense and fruits are upright, comes from Eastern Asia. 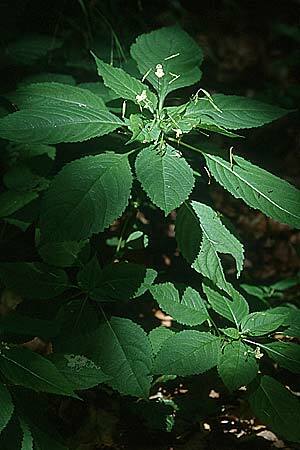 Left: Since about 1830 the Small Balsam Impatiens parviflora from Asia came into wout woods, where it is area-wide available today. 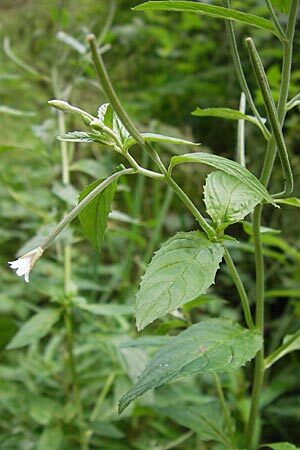 Right: The Indian Balsam Impatiens glandulifera has been introduced about 1840 from the Himalayas to England as feeding plant for honey bees. 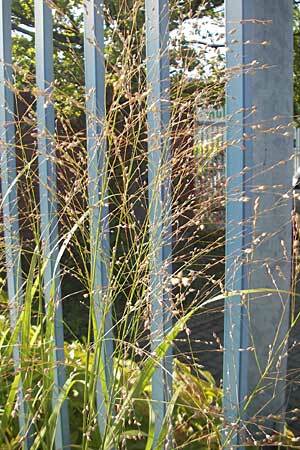 Since then it distributed at wet places almost all over Europe and displaces the native flora. 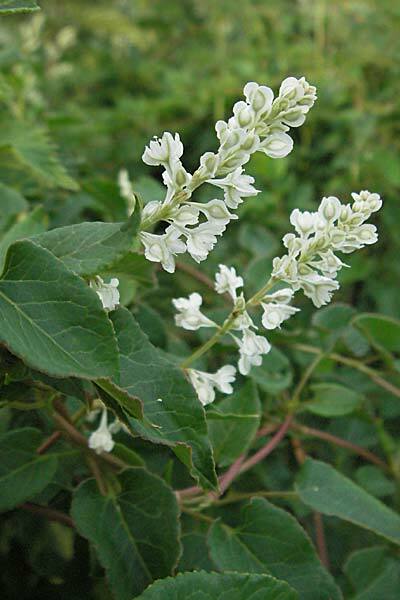 Also neophytic species like Hybrid Knodweed Fallopia x bohemica, one of its parents, Japanese Knodweed Fallopia japonica and Russian Vine Fallopia baldschuanica, which have been introduced as ornamental plants, are wide-spread now not only in the 'Kurpfalz'. 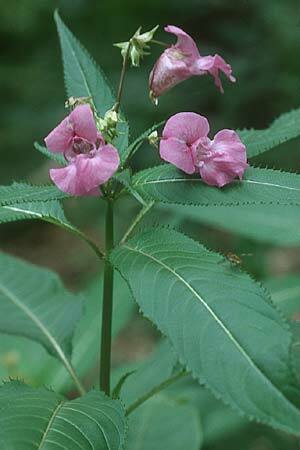 Where one of these three plants occurs the native flora is very endangered to be displaced. 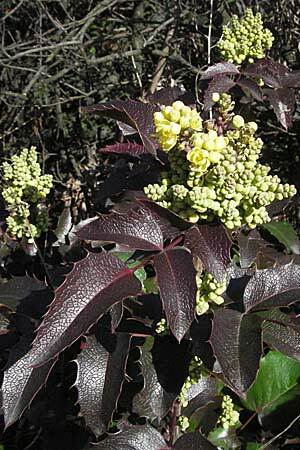 Many of the foreign ornamental plants, which the city gardener departments are using for amenity planting today, are able to reproduce in our climate. 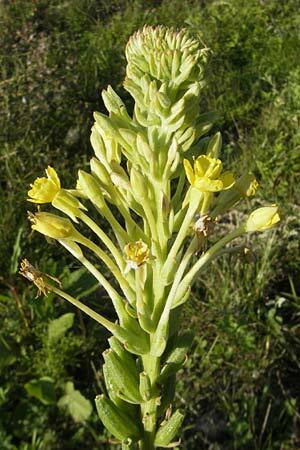 As always more new plants come into fashion, there is a risk that the number of neophytes will be dramatically increased soon, which can have incalculable consequences for the native nature. 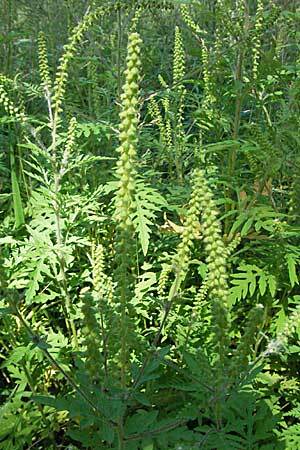 The next two rows show some of these plants, which e.g. in Weinheim (Bergstrasse, Southern Germany) already have run wild. 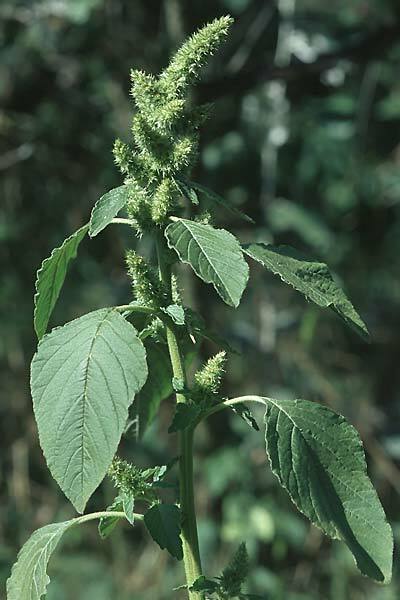 Large-Leaved Nettle Urtica membranacea which is not rare in the Mediterranean has been found in the City of Mannheim. At the abandoned switch yard at Mannheim the Bluebeard ran wild from a planting. 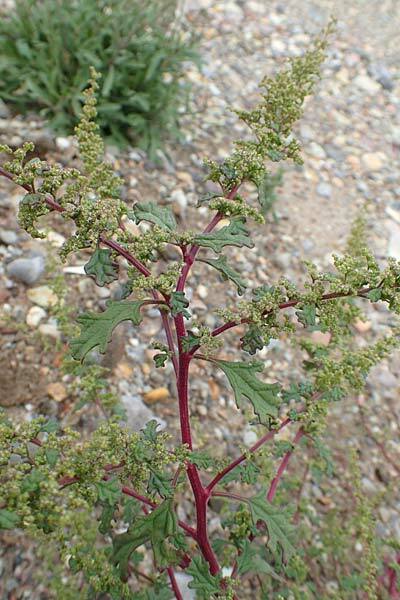 The Horehound Motherwort Leonurus marrubiastrum can be found at the inlet to the Mannheim industrial port since many years. 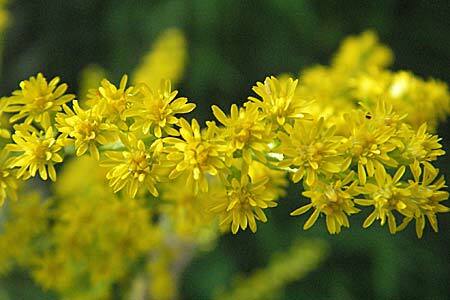 Home of the plant are Eastern Europe and Asia. 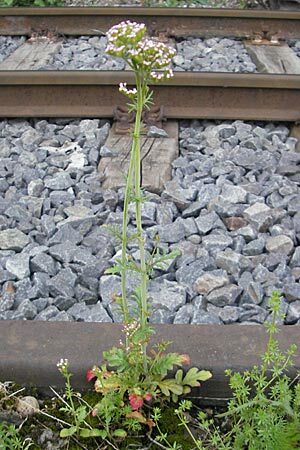 The plants in the next row have been found on soil depots in Heidelberg-Pfaffengrund on the site of a former freight train terminal. In the last years the first two of these can often be seen as green of traffic islands, the third one is a garden escape. 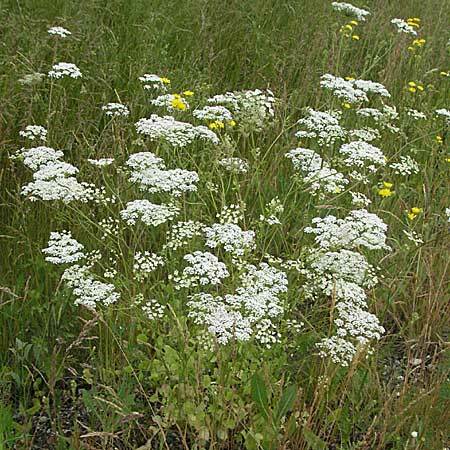 In this row you can find some introduced Umbellifers. 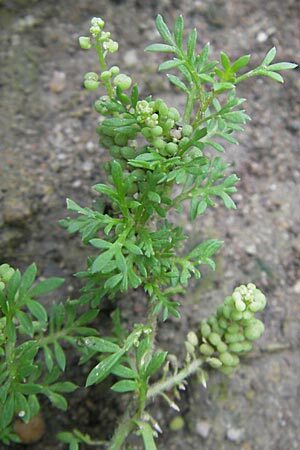 Southern Burnet Saxifrage Pimpinella peregrina, which originates from the western Mediterranean, is currently about to establish in southern Germany. 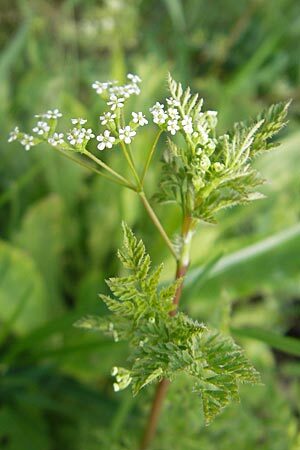 The Bur Chervil Anthriscus caucalis is not rare on the Friesenheimer Insel near Mannheim. It came from the Mediterranean. 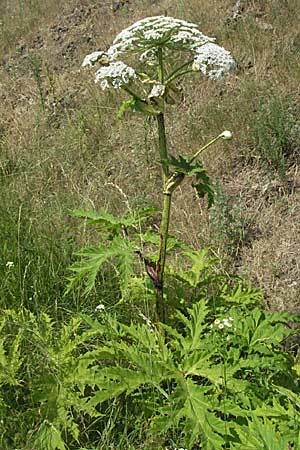 The Giant Hogweed Heracleum mantegazzianum, which has been introduced from the Caucasus as an ornamental plant, grows taller than a man and if it is touched it can cause burnings on the skin. 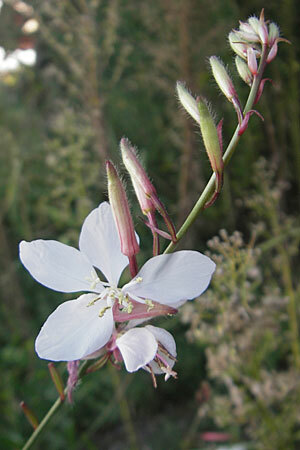 For this reason people combat against stems of this species which ran wild. 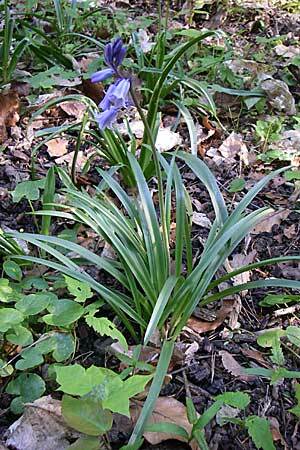 In the following three rows you find some introduced Crucifers. 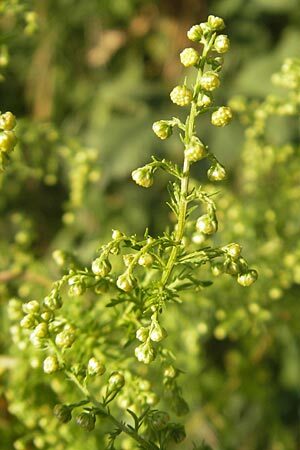 The Least Pepperwort Lepidium virginicum is only an example for several Pepperwort species which have been introduced from America. 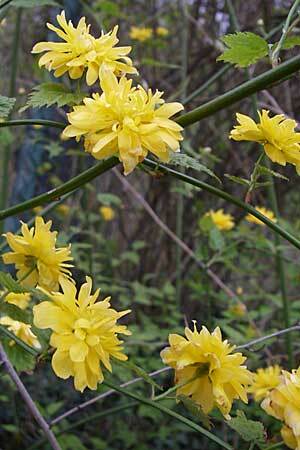 Honesty Lunaria annua, a favourite garden plant, runs often wild. Its origin is Southern Europe. 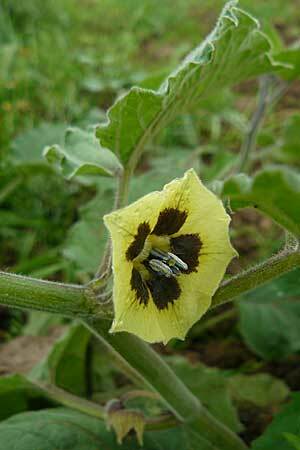 The Warty Cabbage Bunias orientalis, which has been introduced with seed, came from Armenia and South-East Europe. 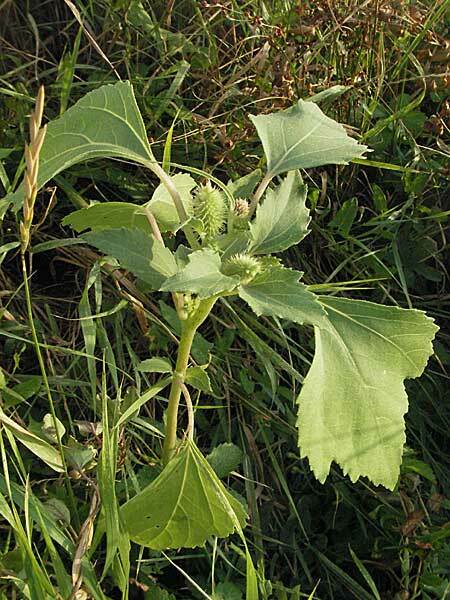 The Horse Radish Armoracia rusticana is a useful plant which has tun wild. Its native place is the Don - Wolga region of Russia. The False London Rocket coming from Eastern Europe to Central Asia isn't rare near Mannheim. 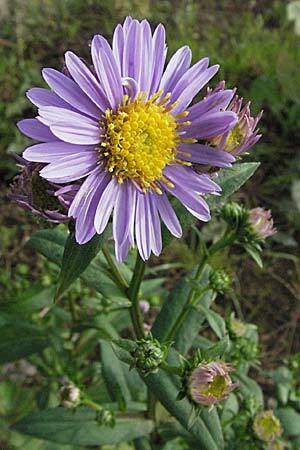 Its flower starts in may, but most of the plants are in flower in September. 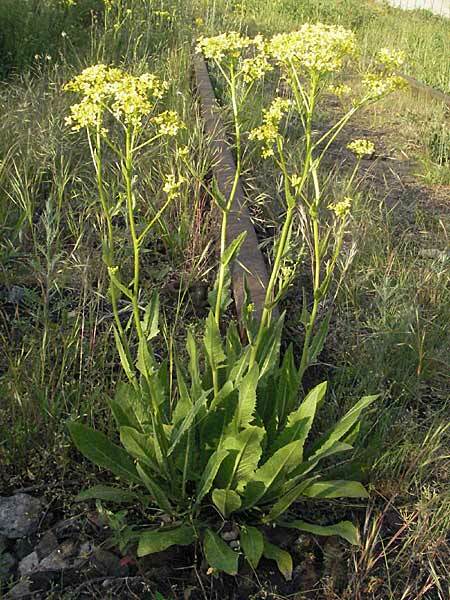 The Eastern Rocket originates from the Russian Steppe. At the warehouses of the Mannheim Rhine port it has abundant sites. 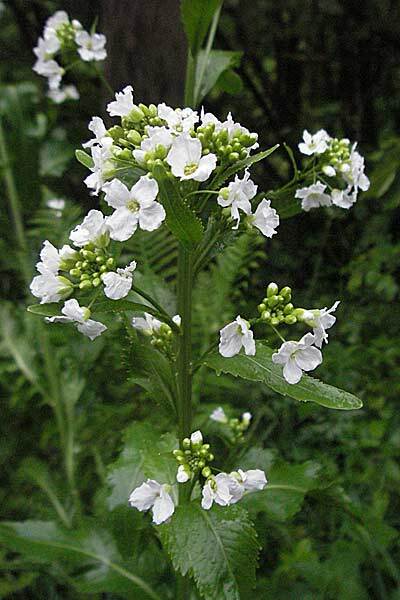 Oben: Die Hoary Cress Cardaria draba wurde seit dem 18. Jahrhundert aus dem Mittelmeergebiet und Asien eingeschleppt. Mit dem Eisenbahnbau im 19. Jahrhundert wurde sie in Mitteleuropa großräumig verbreitet. 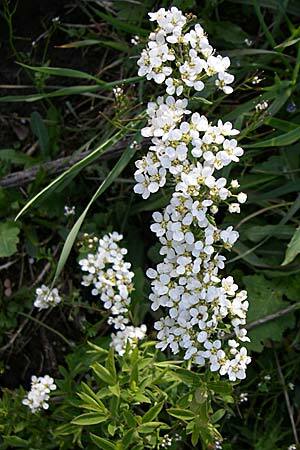 Above: The Hoary Cress Cardaria draba has been introduced from the Mediterranean and Asia in the 18th century. It has been widely distributed in Central Europe when the railways were built in the 19th century. 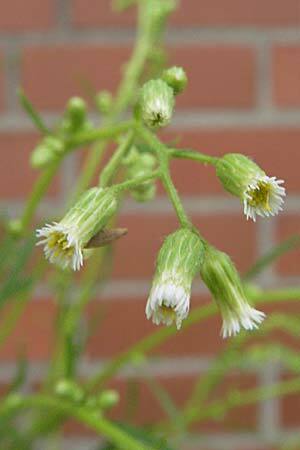 Above: Sweet Alison Lobularia maritima has been imported from the western Mediterranean as a garden flower. At some places it runs wild here. 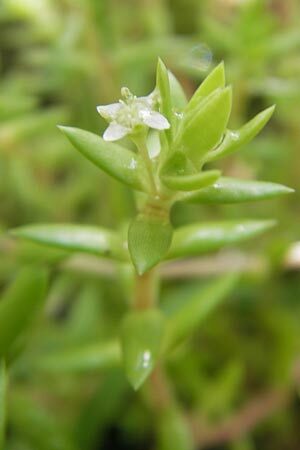 Above: The Lesser Swine Cress Coronopus didymus originates from South America, but today it's spread more or less world wide. 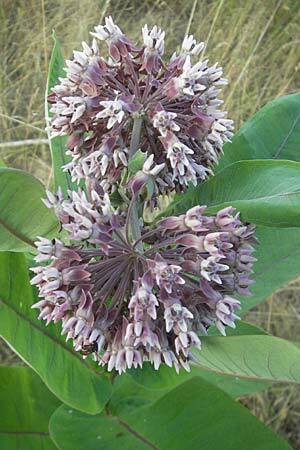 Above: A group of Purple Silkweed Asclepias syriaca, which becomes bigger with the time, can be found on sandy soil near Waghäusel-Wiesental. 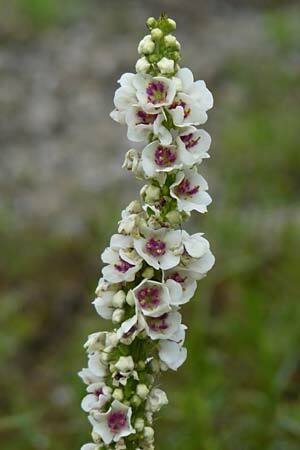 Above: The more than an meter big Dalmatian Toadflax Linaria dalmatica, which comes from the eastern Mediterranean, colonizes on an inland dune near Seeheim-Jugenheim. 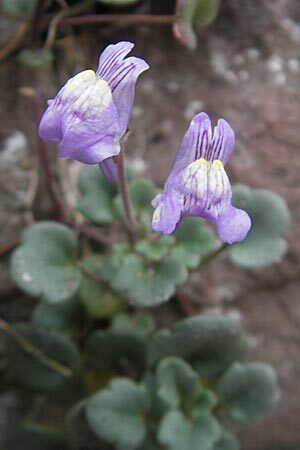 Above: The Italian Toadflax Cymbalaria pallida originates from Central Italy. 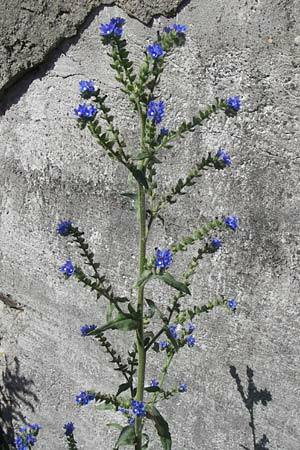 Recently it has been found at walls of some cemeteries in the Kraichgau. 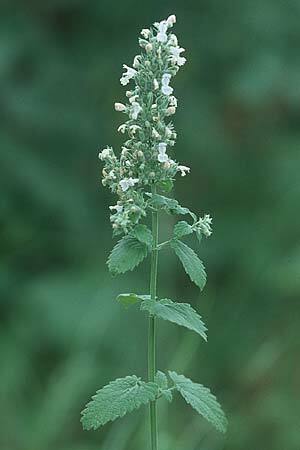 Left: The Catnip Nepeta cataria originates from the pannonian steppe and is widely distributed on the sandy soils of the Upper Rhine valley. 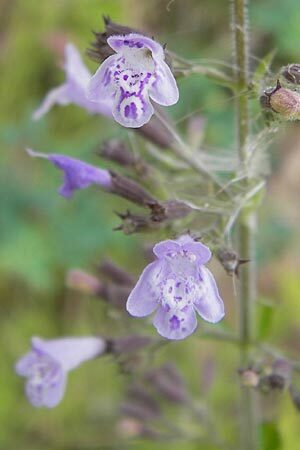 Right: Several blue Catnip species which originate from Asia as well as hybrides between these which have been bred by gardeners often run wild in the vicinity of plantings. 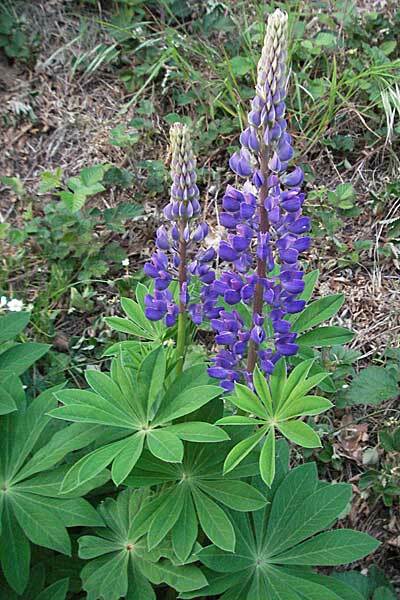 The Garden Lupin Lupinus polyphyllus originates from the Pacific side of North America. 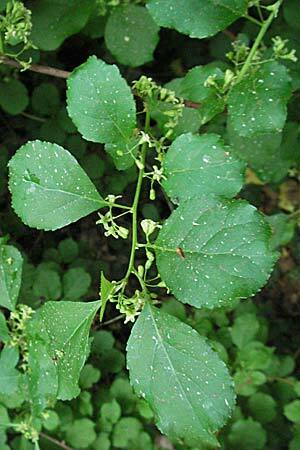 In woods it is grown to feed the deer and to improve the soil with nitrogen, and partly it runs wild. 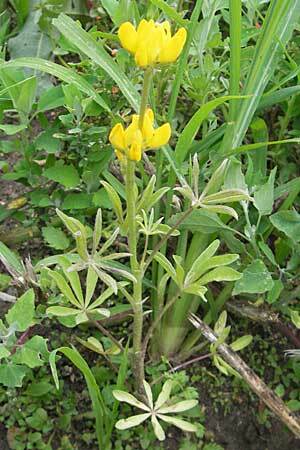 The smaller Yellow European Lupin Lupinus luteus, which originates from the Mediterranean, I found at Weinheim in the area of a big construction site. 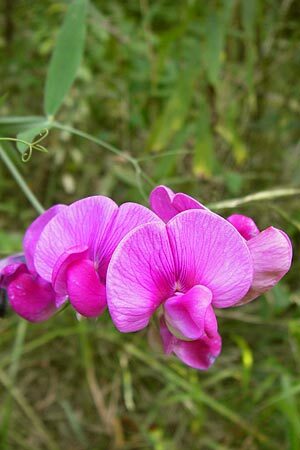 The Broad-Leaved Everlasting Pea Lathyrus latifolius which comes from the Mediterranean is an ornamental plant which frequently runs wild. 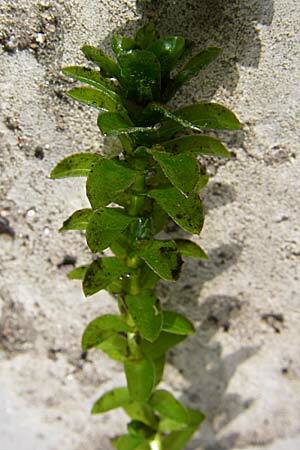 The Hairy Rupture-Wort Herniaria hirsuta which comes from Asia and the Mediterranean can be found between pavement joints at the Mannheim water tower. 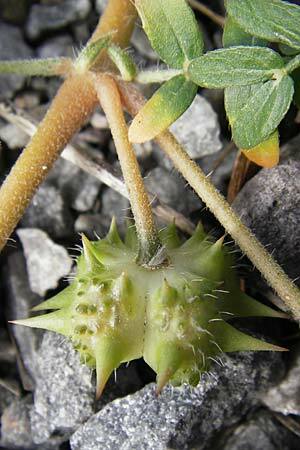 I found a big plant of Small Caltrops Tribulus terrestris, which originates from the Mediterranean, in the Mannheim port. 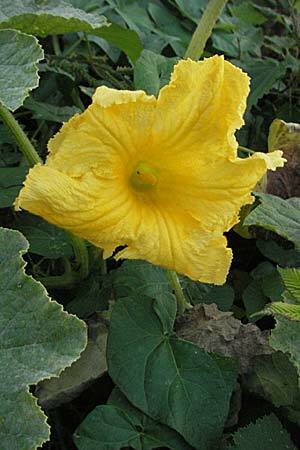 It was in flower for some years, but in between it has disappeared again. 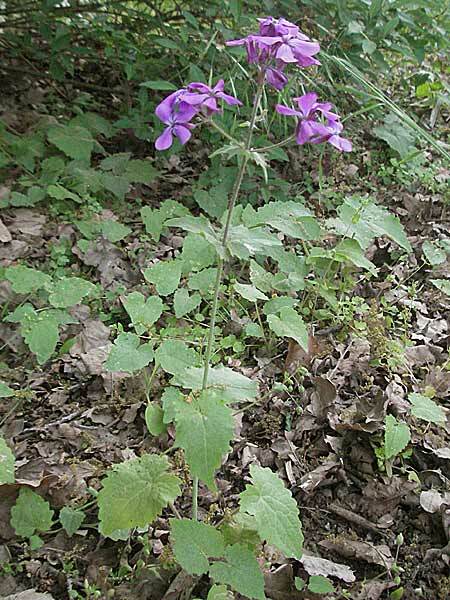 The Little Robin Geranium purpureum spreads mainly along railway lines. 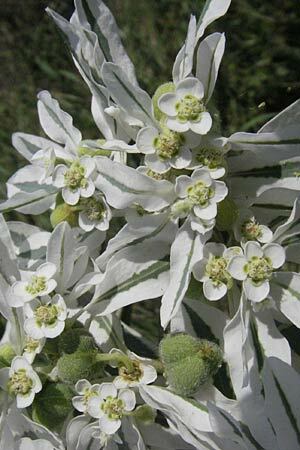 It originates from the Mediterranean. 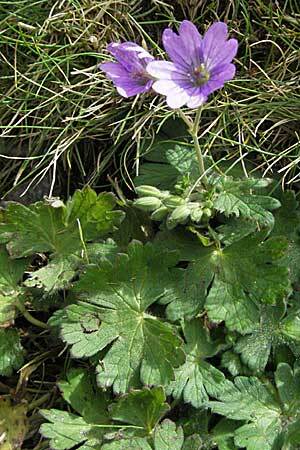 The Hedge-Row Crane's-Bill Geranium pyrenaicum has once been introduced as ornamental plant. Since about 1800 it ran wild. Its home are Southern European mountains. 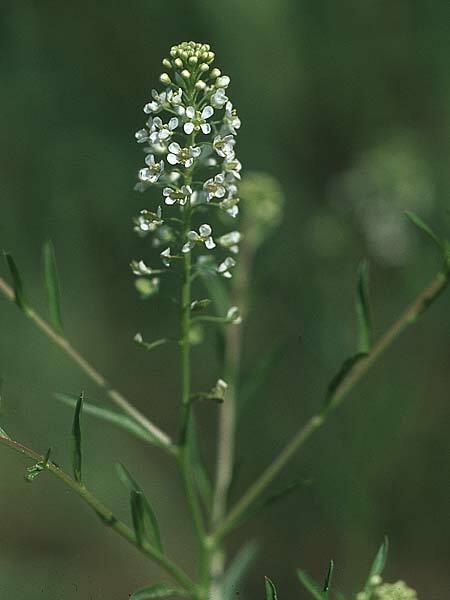 The Wall Bedstraw Galium parisiense, which originates from West and South Europe, has sites in the Mannheim ports. 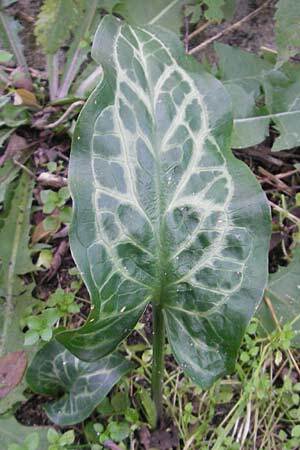 Left: The Italian Lords and Ladies Arum italicum from the Mediterranean is grown in gardens as an ornamental plant. 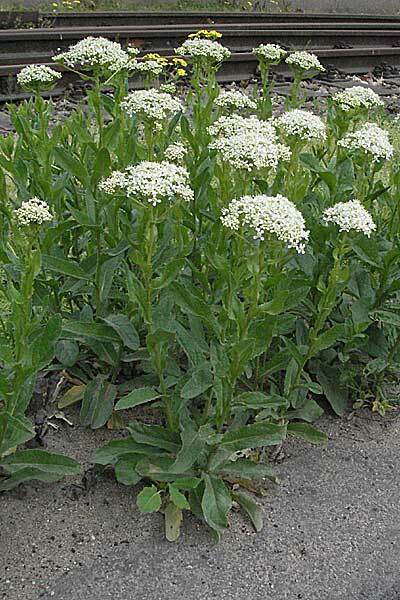 Recently reports are cumulating that it appears in gardens or on wasteland where it has never been planted. 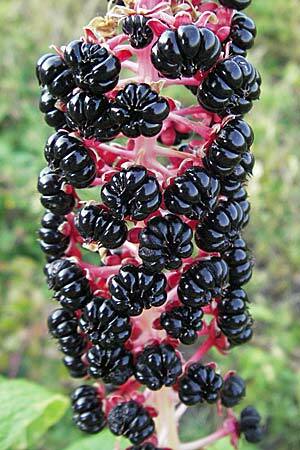 Presumably its red berries are spread by birds. 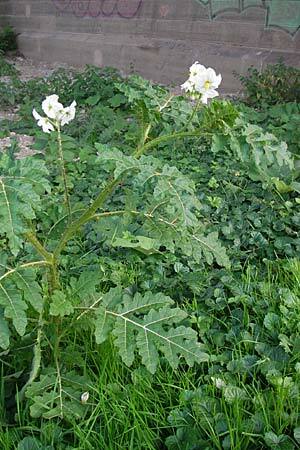 In Ludwigshafen there was a site with hundreds of plants which again disappeared some years later when Robinia trees came up. 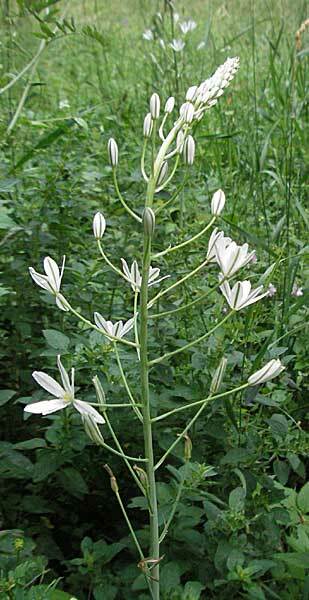 Right: A Spider Plant obviously risen from seed was found in the city of Mannheim. 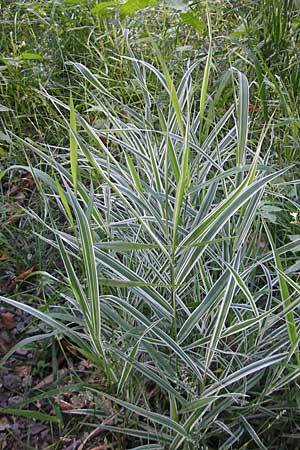 Even if the parent plant had two-colored (variegated) leaves, the leaves of plants risen from seed are unicolor green anyway. 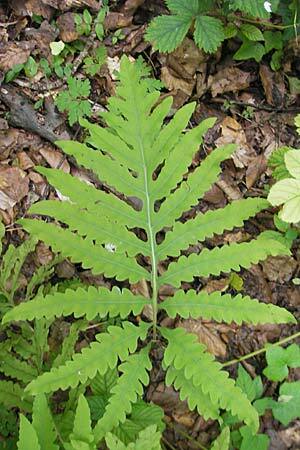 Left: The Sensible Fern Onoclea sensibilis has been introduced from America. Near Nußloch in the wood a colony is growing, which might have escaped from a garden. 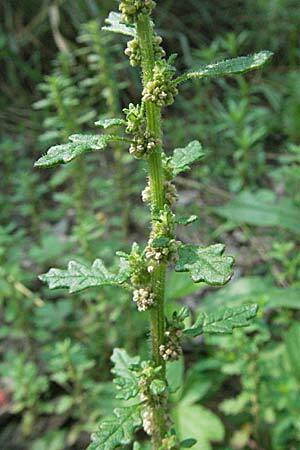 It reproduces well, and there are some sporangia. 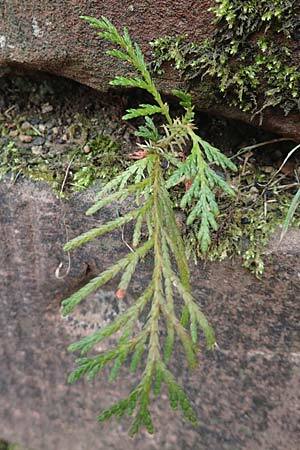 Right: Several stems of the Japanese Holly Fern Cyrtomium fortunei, which comes from America and Eastern Asia, are occurring at a wall at the Mannheim Hospital. 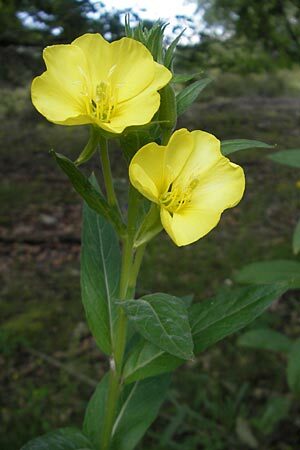 The origin of Evening Primroses is America. 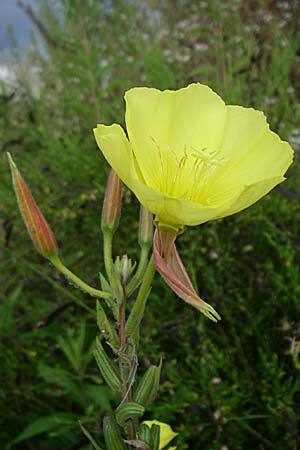 The most frequent one here is the Common Evening Primrose Oenothera biennis. 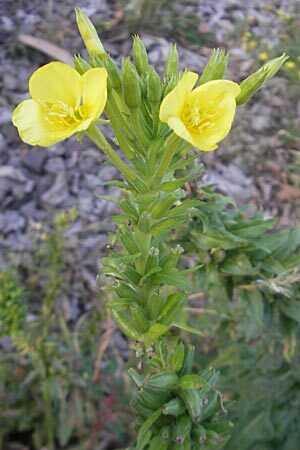 Some more rarely in the sand dune regions of the Northern Rhine Valley is Large-Flowered Evening Primrose Oenothera glazioviana, which has bigger blooms and a reddish calyx. 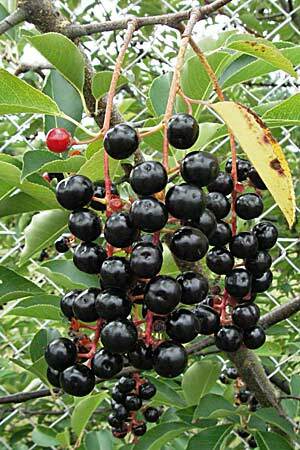 There are some more and more rare species, which have been introduced from America. 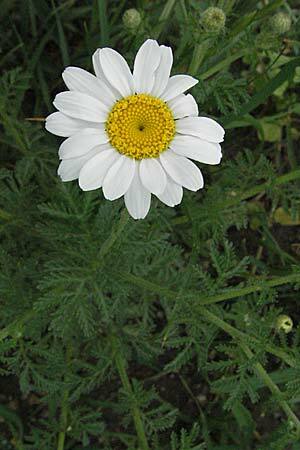 More species have generated in Europe hybridgenously from the American species. 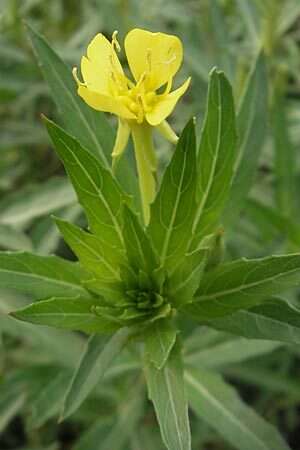 The relative small flowered Sandy Evening Primrose Oenothera oakesiana has already been introduced in the 17th century. 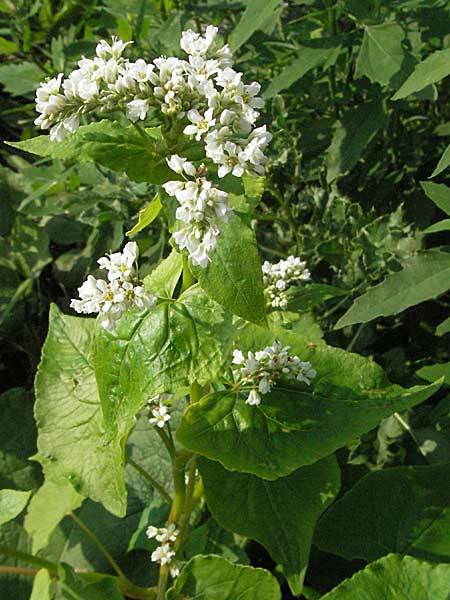 An Enchanter's Nightshade which comes from the Himalayas I found in July 2006 near Mannheim-Friedrichsfeld on soil which had been brought here from another place. In the following year it was disappeared again. 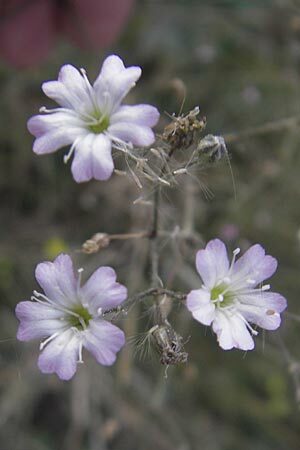 The Panicled Willowherb Epilobium brachycarpum settles on sandy areas, e.g. at Mannheim, Ludwigshafen, Reilingen, and Hirschberg. 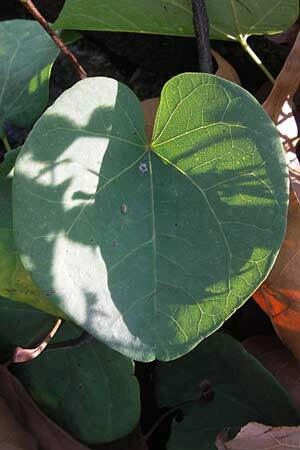 It originates from the Pacific side of North America. 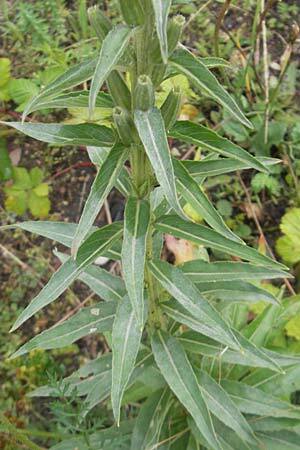 At edges of paths in the Odenwald the Fringed Willowherb can be found which originates also from America. 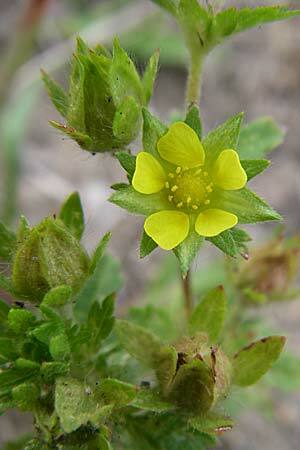 Rough Cinquefoil Potentilla norvegica originates from Eastern Europe and Middle East. 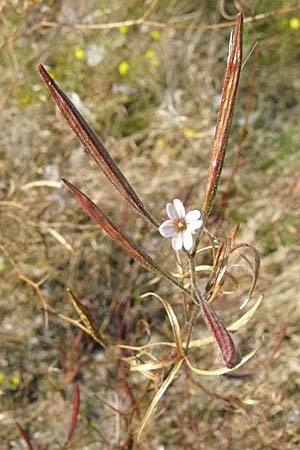 I found few stems of the species near the big power stations of Mannheim-Neckarau, but the site has been destroyed a few weeks later. Near Viernheim it can be found in some years. 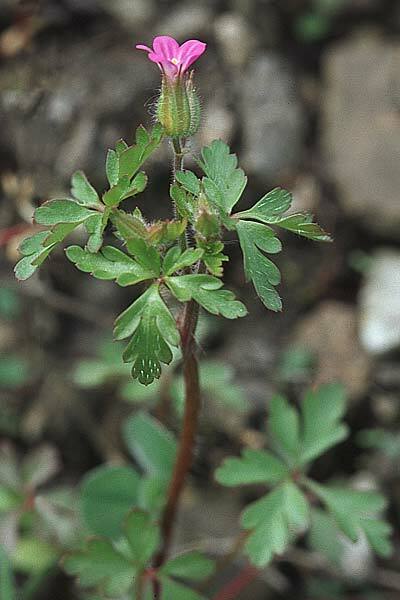 The similar Downy Cinquefoil Potentilla intermedia grew near a soil depot near Viernheim. 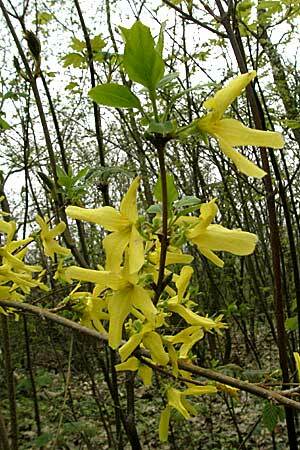 It originates from Northern Europe and Sibiria. 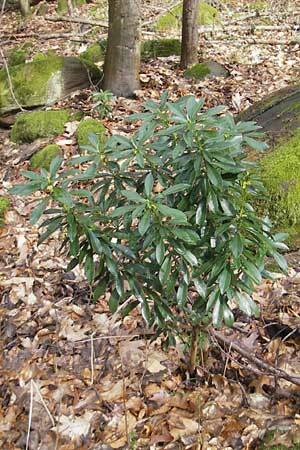 Also near Karlsruhe I managed to find a single plant. 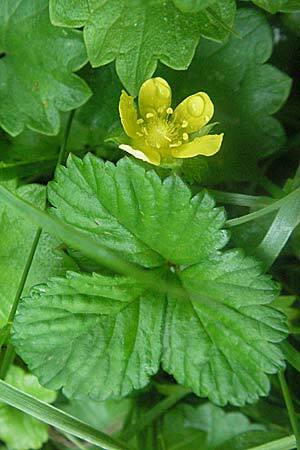 The number of sites of the Yellow-flowered Strawberry Duchesnea indica has multiplied within the last years. 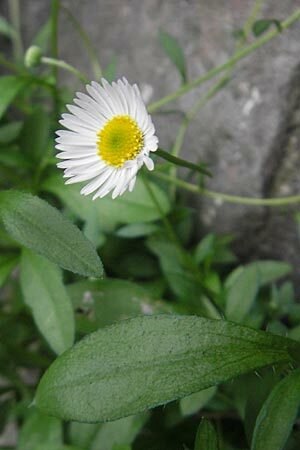 It had been introduced from East Asia as a garden plant for parks. 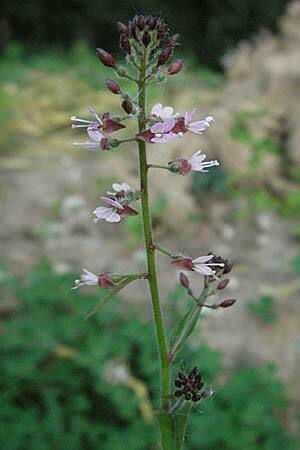 Annual Valerian Centranthus calcitrapae is native in the Mediterranean. 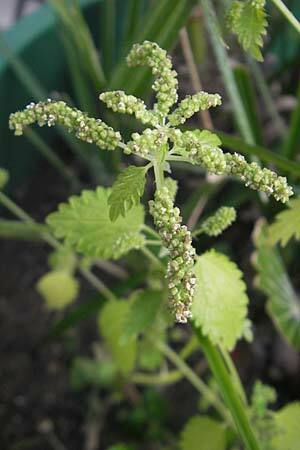 I had never heard of an occurrence in Germany when I found it in the Mannheim port in beginning of May 2009. In the same year it has also been found in the Kehl port. Unfortunately during the winter the area in the Mannheim port has been recasted and covered with coarse ballast, so since then it couldn't be be found any more. 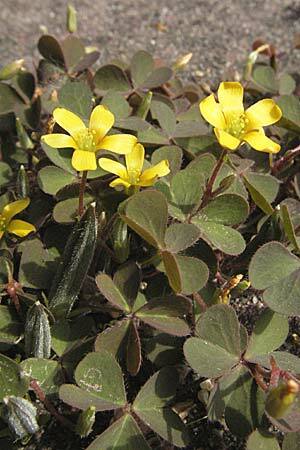 Some yellow flowering Oxalis species are coming from different continents. 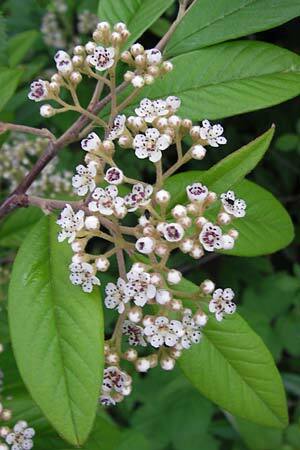 The species on the photo above originates from North America and Eastern Asia. 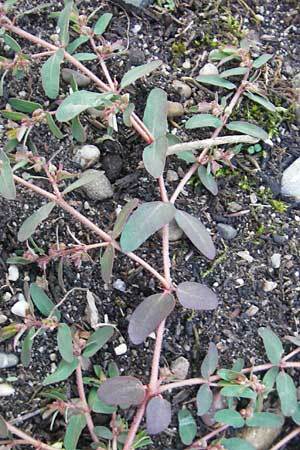 Also Dillenius' Sorrel Oxalis dillenii from Eastern North America is occurring here, e.g. in Mannheim and Weinheim. 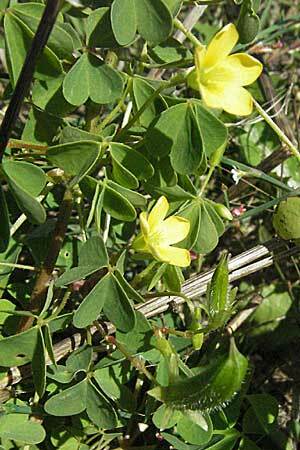 The Procumbent Yellow Sorrel, which is widespread in almost all villages of Central Europe today, originates from South America. 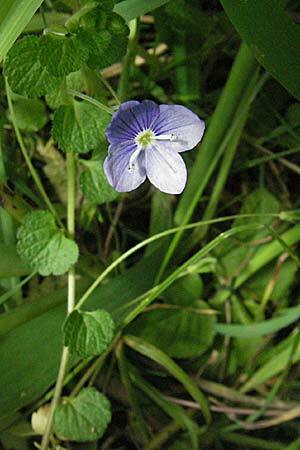 The American Speedwell Veronica peregrina originates from America, where it grows on the whole continent from Alasca to Tierra del Fuego. 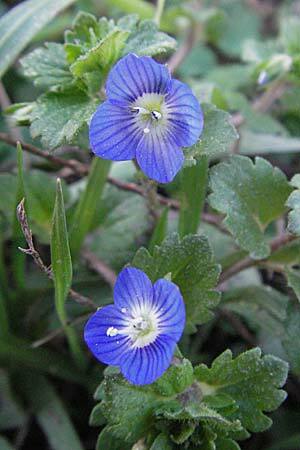 The Slender Speedwell Veronica filiformis originates from Caucasus. 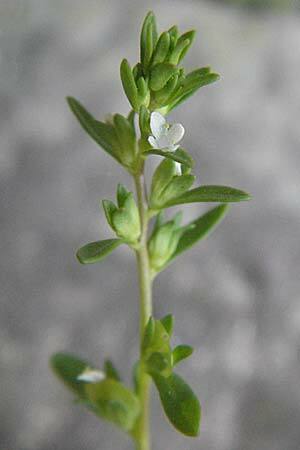 The Common Field Speedwell Veronica persica originates from Asia, and was introduced in Central Europe with ornamental plants about in 1800. In between is is distributed over most parts of the world. 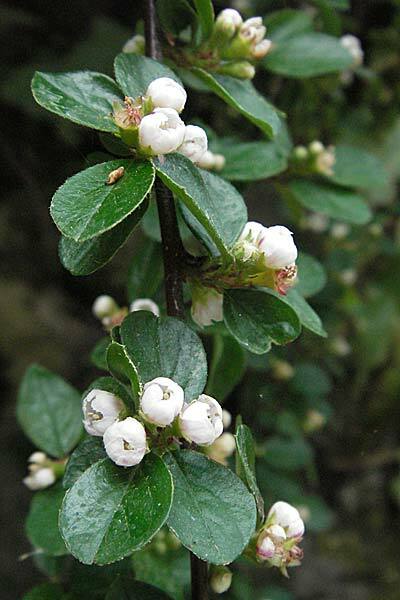 It is in flower over almost the whole year except in winter. 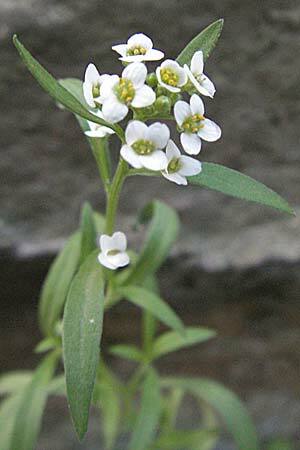 The Garden Baby's Breath Gypsophila scorzonerifolia comes from Russia and is also naturalized in Eastern Germany. 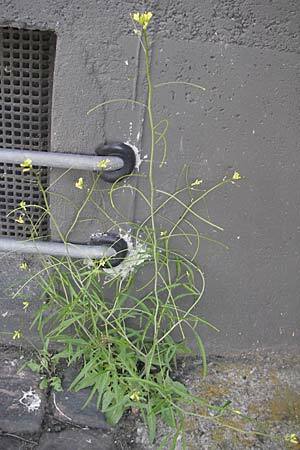 A strong plant grows on wasteland in the Kaiserwört port of Ludwigshafen. 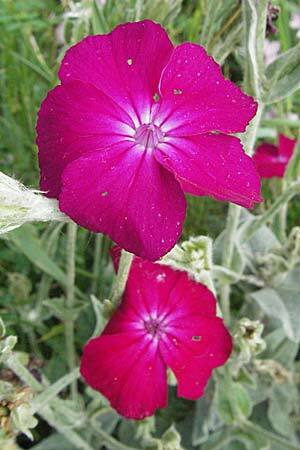 Rose Campion Silene coronaria has also escaped from gardens. I found it e.g. on the Friesenheim Insel at Mannheim. It's origin is the Mediterranean to Western Asia. 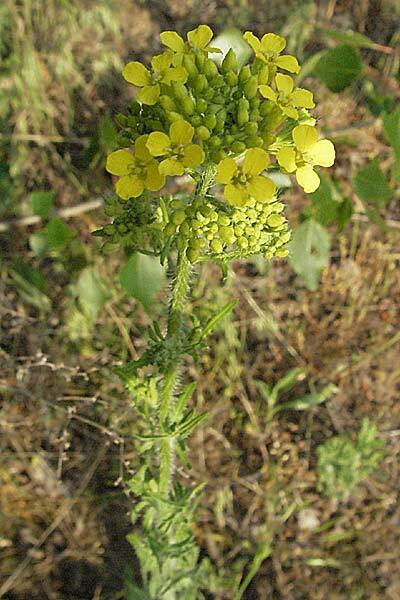 Rather rarely, but occasionally, not only in the Kurpfalz but also in sandy areas of Palatina and Rhine-Main region the Yellow Burweed appears, which originats from Southern America. Since some years there is a rich site in Mannheim. 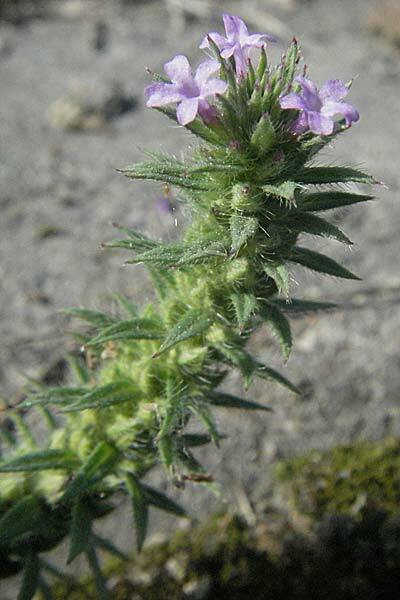 The Bracted Vervain Verbena bracteata comes from America, and is naturalized in the port of Mannheim - Rheinau and has also been found on the Friesenheimer Insel. 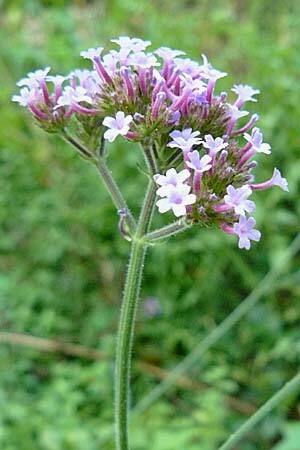 Near Reilingen I found Purpletop Vervain Verbena bonariensis at the edge of a wood. Most probably it originates from garden waste. 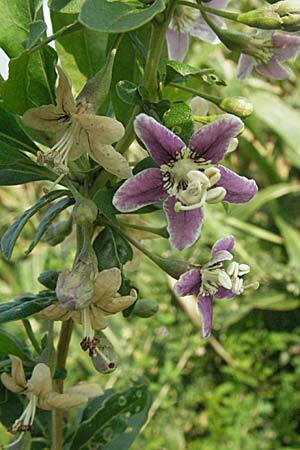 The plant originates from Brasil and Argentinia. 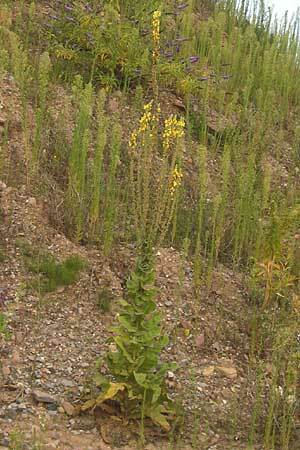 In the port of Mannheim-Rheinau a sizeable colony of Mountain Ironwort Sideritis montana is growing since many years. 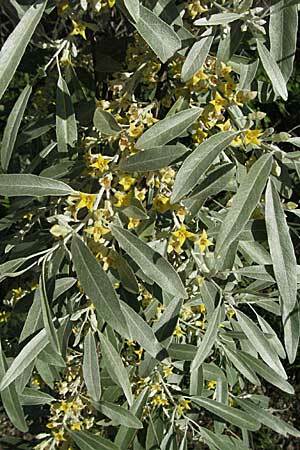 The plant comes from the Mediterranean. 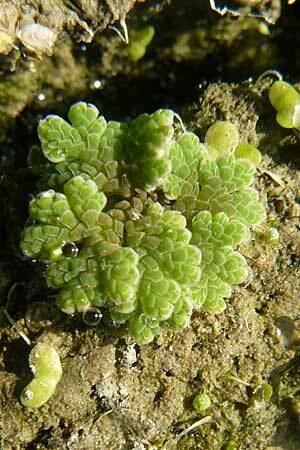 A big population of Swamp Stonecrop Crassula helmsii grows in a pond near Schauernheim in Palatina. 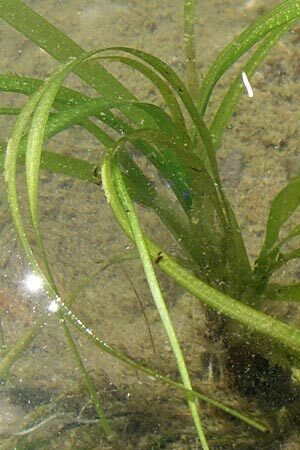 It originates from Australia and is used in aquariums. Pferdstriebduene at Sandhausen. It climbs trees up to 8 meters high. It origin is Eastern Asia. 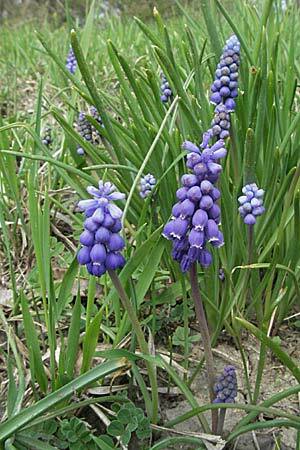 Near Weinheim there are still sites of the Armenian Grape Hyacinth Muscari armeniacum, which came from the Mediterranean, and of the Pyramidal Star of Bethlehem Ornithogalum brevistylum, which originates from South Eastern Europe and Russia. 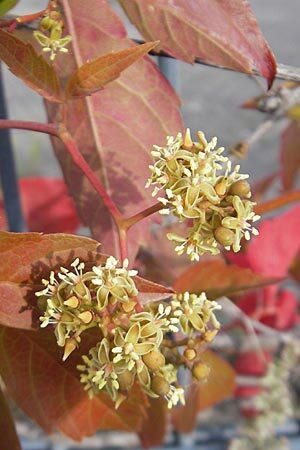 Both had been introduced as ornamental plants in regions with viticulture climate, and can still be found near Weinheim. 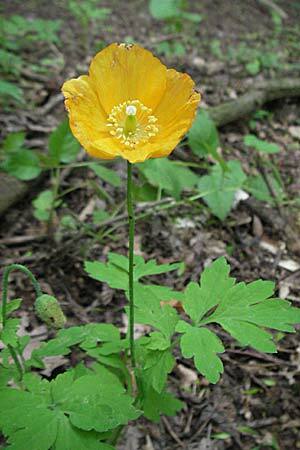 Between Gorxheim-Trösel and Unterabtsteinach in the foremost part of the Odenwald grows Welsh Poppy Meconopsis cambrica at a path in the wood. Most probably it is a garden escape. 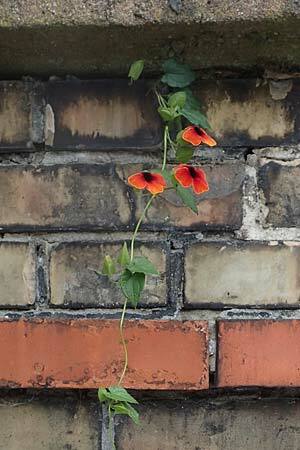 In the port area of Ludwigshafen a single plant of Thunbergia alata grew in a small gap of a wall. 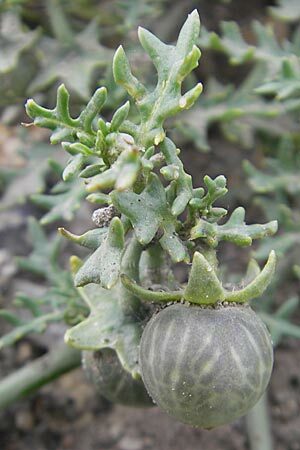 The Four-Leaved Allseed Polycarpon tetraphyllum arrived from the Western Mediterranian. 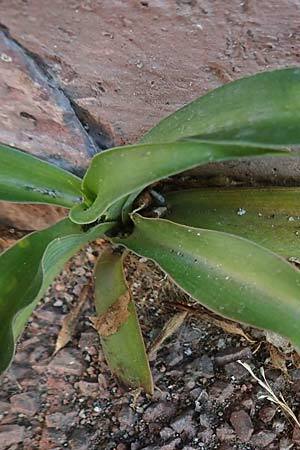 It can already be found in gaps between paving stones e.g. in Speyer and Weinheim-Lützelsachsen. Often, e.g. 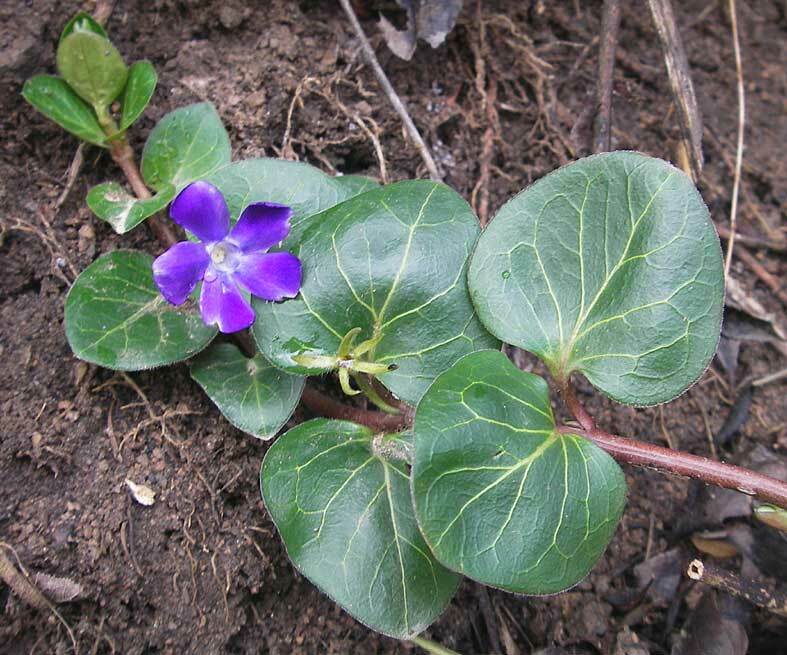 above Weinheim, the Greater Periwinkle Vinca major has escaped from gardens. 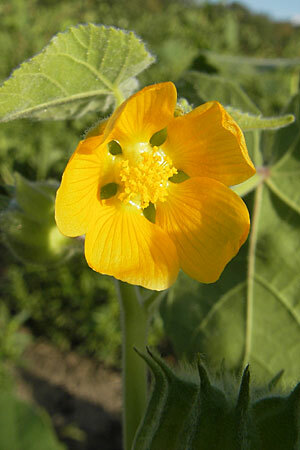 It originates from the Mediterranean. 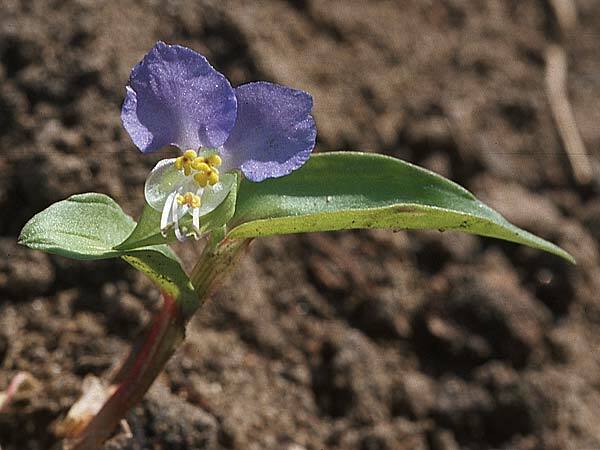 Near Reilingen and Oftersheim Spiderwort Commelina communis has run wild. Its origin are gardens, too. 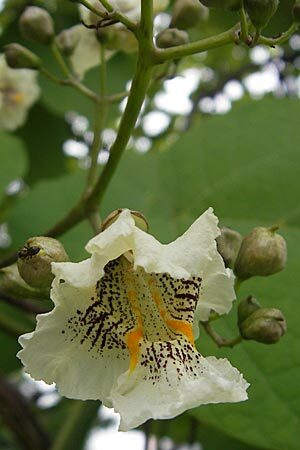 It had been introduced from East Asia. 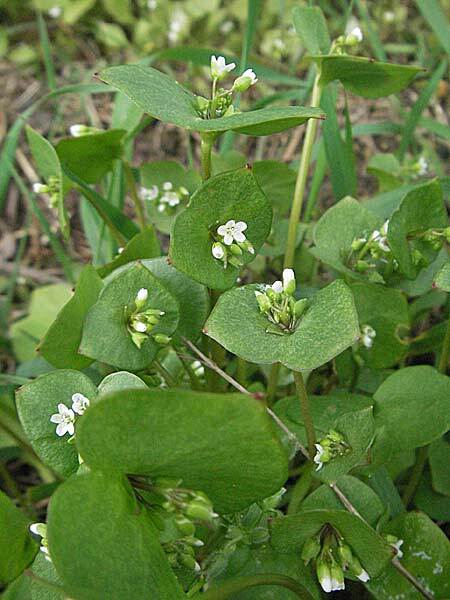 Miner's Lettuce Claytonia perfoliata, which was cultivated as vegetables, and which ran wild in regions with sandy soil which is the case in parts of the 'Kurpfalz', originates from the western part of North America. 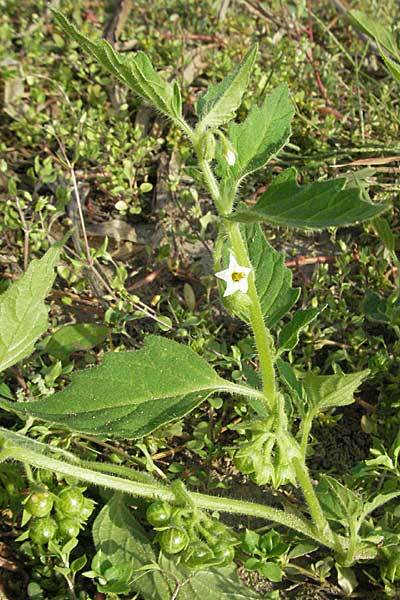 Physalis peruviana are growing on the low meadows along the Neckar river at Mannheim. 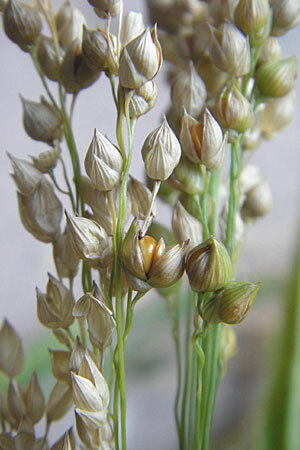 The seed had been ashored at high water. Many Tomatoes Lycopersicon esculentum, Marrows Cucurbita pepo, and more rarely also Musk Melon Cucumis melo can be found at the Neckar and Rhine shores near Mannheim after floodwater. 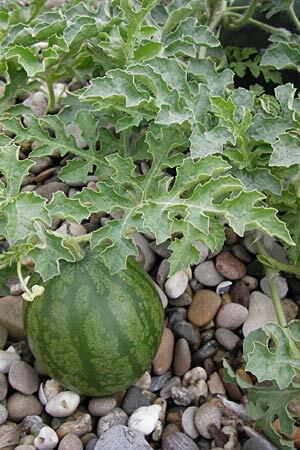 Top left: Several plants of the Water Melon Citrullus lanatus, of which the biggest one brought even fruits, have been found at the Rhine shore at Mannheim. 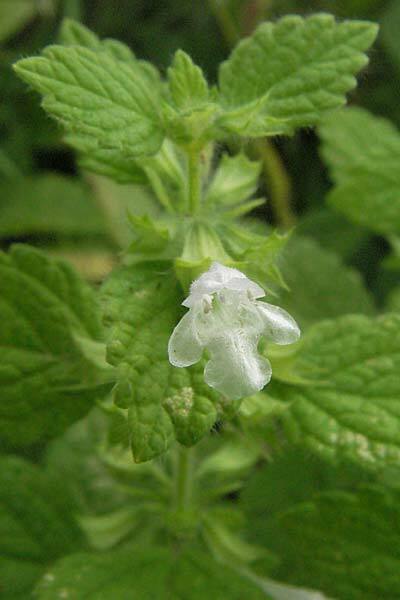 Left: A typical example for several herbs, teas and aromatic plants, which have been introduced from the Mediterranean or the Orient and which sometimes run wild, is Balm Melissa officinalis. Right: On waste land of the Friesenheimer Insel at Mannheim young plants of the Common Lavender Lavandula angustifolia habe been found. They might have reproduced in the years with mild winters. 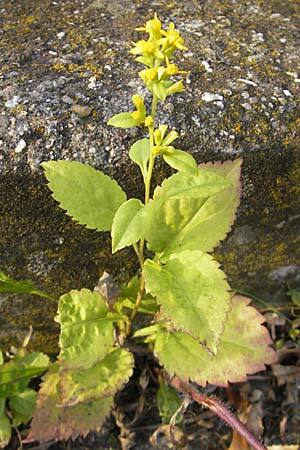 Below: I found a small group of Buckwheat Fagopyrum esculentum on the Friesenheimer Insel in Mannheim at the Rhine dam. 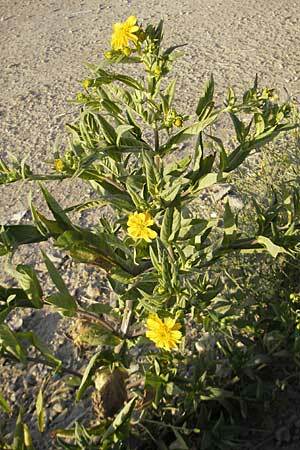 It originates from the Central Asian steppe. 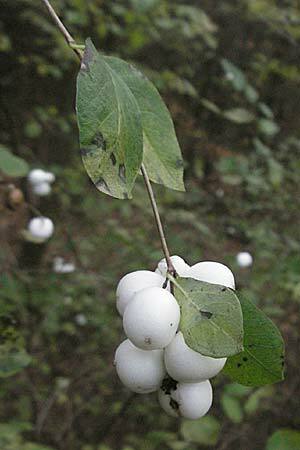 Formerly the plant has been grown because its seed contains starch. 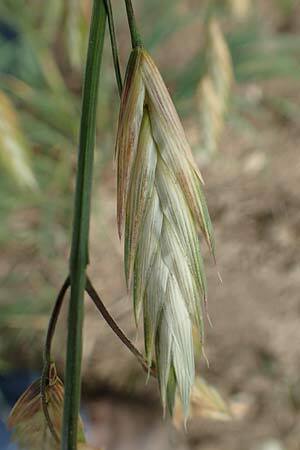 But because it is frost-sensitive it was ousted by the cereals. 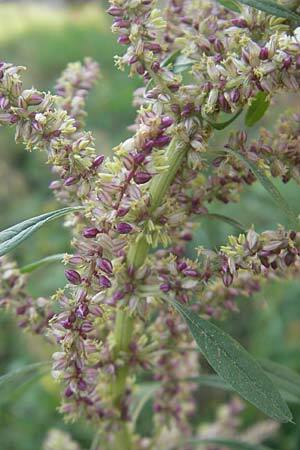 originated from hemp corns out of food for birds. 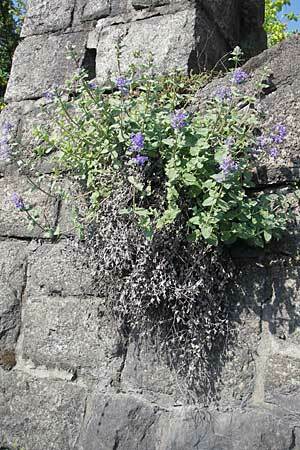 Most of these were growing on soil which had recently been transferred from building grounds, another one at the Rhine shore. 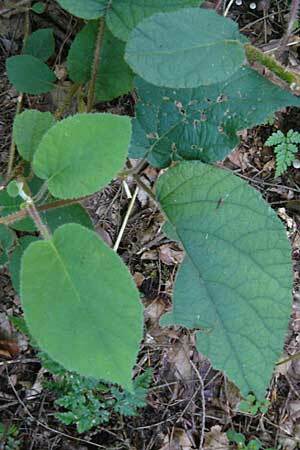 At a path in the forest near Heidelberg a Kiwi plant has been found. 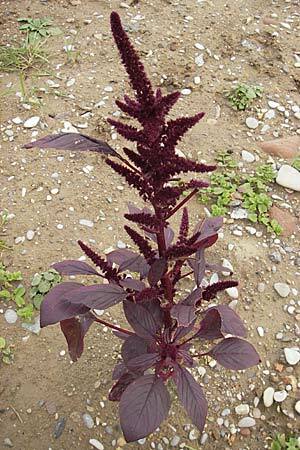 The Red Pigweed Amaranthus cruentus is cultivated in gardens as ornamental plant. On a soil depot near Viernheim it had been running wild, and can also be found in Mannheim at the Neckar. 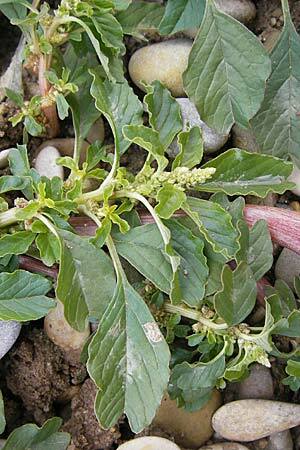 Rightmost: The Pendant Pigweed Amaranthus caudatus runs often wild out of gardens and can be found at different locations of the region. 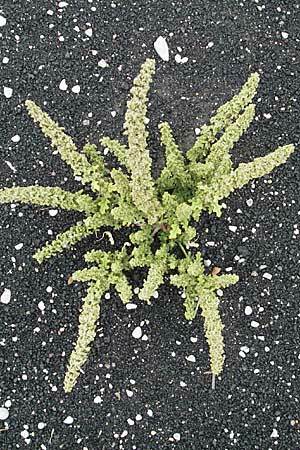 The Clammy Goosefoot Dysphania pumilio has been introduced from Australia. 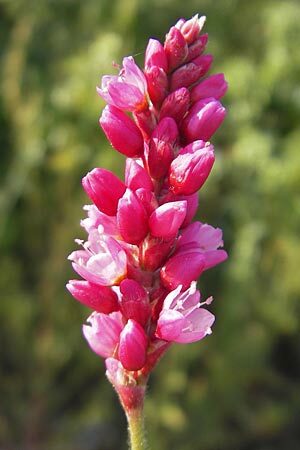 In Europe it grows only in warm regions on sandy soil. 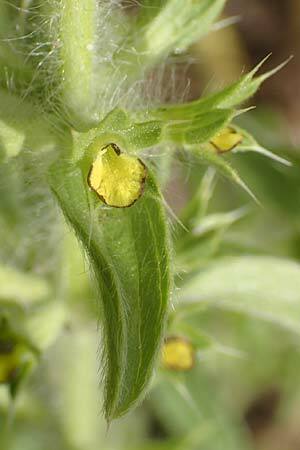 The Sticky Goosefoot Dysphania botrys came from Southern Europe and Asia. A rich site in Mannheim has been a former cole store at the port. 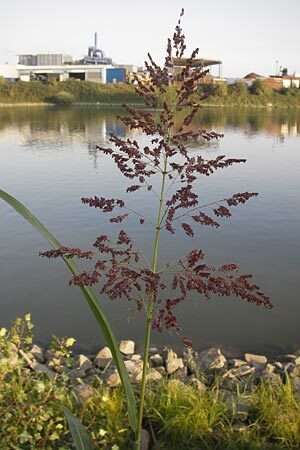 In the Mannheim Rheinau port also the closely related Schrader's Goosefoot Dysphania schraderiana can be found. Its origin are Africa and Asia. 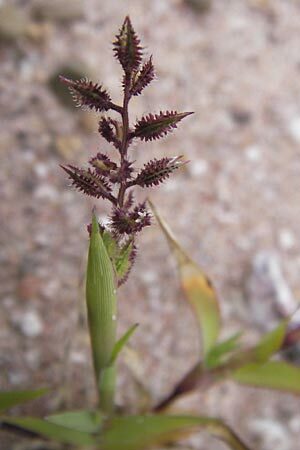 Left: The Spike Burr Grass Tragus racemosus originates from the Mediterranean. Near Mannheim on inland dunes it is widely distributed in between. 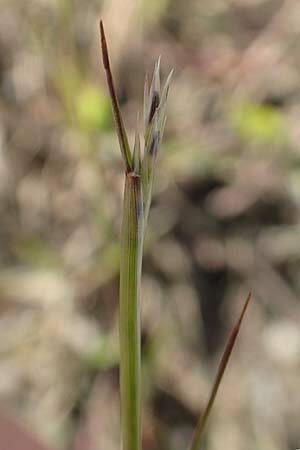 I found the ornamental grass Variegated Ribbon Grass Phalaris arundinacea var. picta at two locations in the wood of the Odenwald. 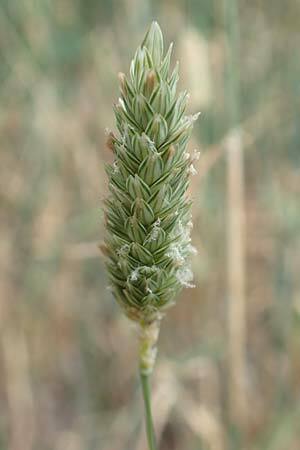 The Italian Rye-Grass Lolium multiflorum is at home in Southern Europe, North Africa, and Western Asia. In Central Europe it is grown to feed animals. Sometimes it runs wild, but only temporarely. 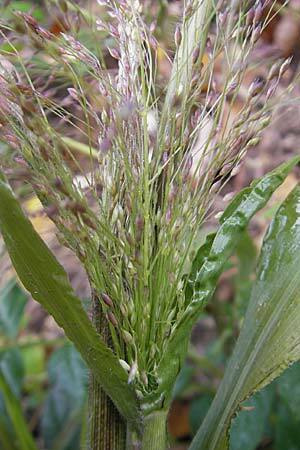 The most frequent of the millets which came from America is the Witchgrass Panicum capillare. Hillman's Millet Panicum hillmanii is similar to the native Witchgrass Panicum capillare, but it has dark brown instead of light beige seed. 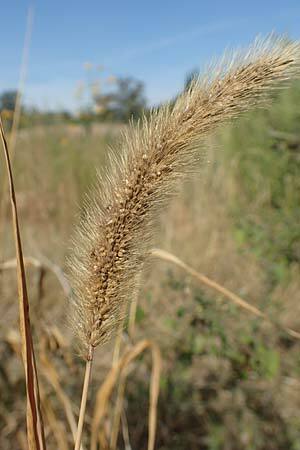 It orininates from America as the similar but more frequent Riparian Millet Panicum barbipulvinatum (right photo). 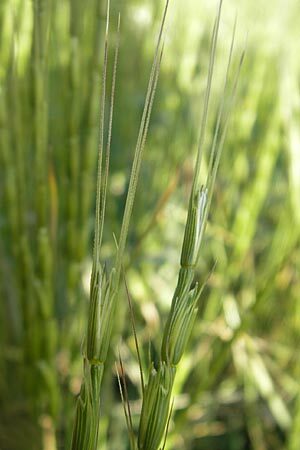 At the edge of a field near Weinheim Mountain Brome Bromus carinatus has appeared, which had been introduced from America, and which also earlier rarely had been found in various regions of Germany. 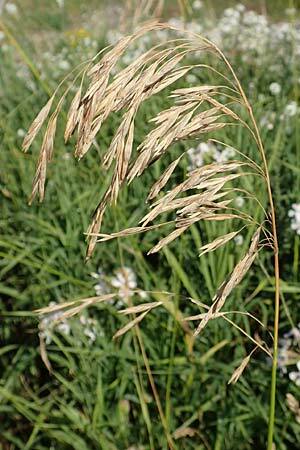 Canary Grass Phalaris canariensis has been found at a slope near the Mannheim Hospital in abundance. 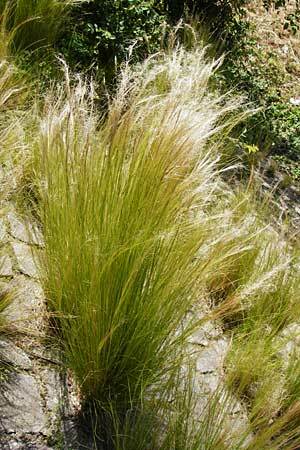 Near the tower buildings at the Northern Neckar shore in Mannheim Mexican Feather Grass Nassella tenuissima has been found run wild, an undemanding grass which is grown in gardens for ornament. 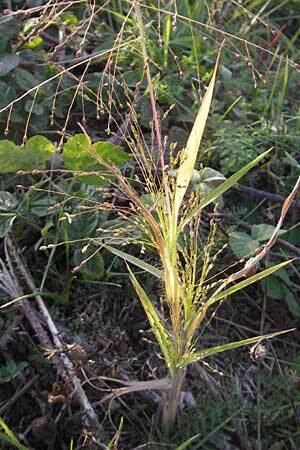 The Rescue Brome which has been introduced from South America, can sometimes be found on agricultural or waste land. 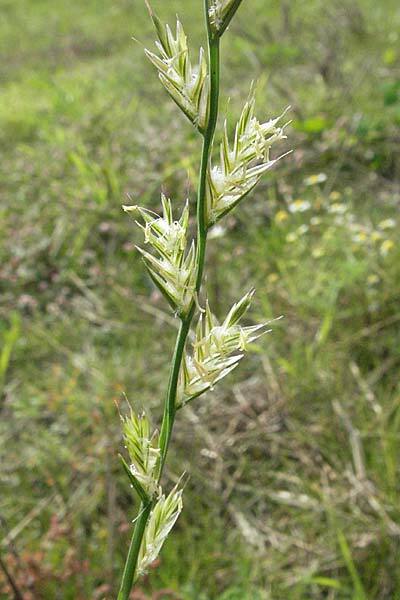 Poverty Grass Sporobolus vaginiflorus which originates from the USA is abundantly available in the former Taylor Barracks, a discontinued US casern at Mannheim. Currently (2017) the Taylor Barracks area is built-up, and it is in question whether the grass will remain. 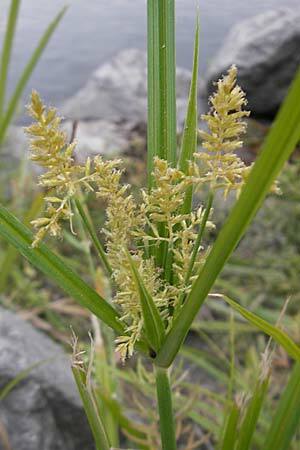 Along motorways in Northern Italy, Slovenia, Austria and Switzerland the grass has been found since tens of years. 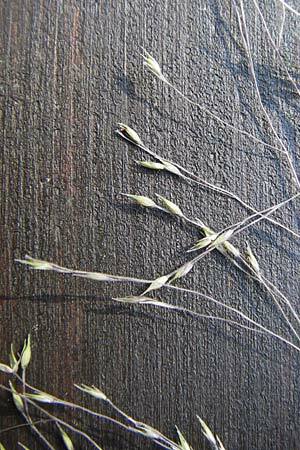 One specimen of Japanese Bristle Grass Setaria faberi was found in 2018 on a former barracks area at Mannheim. Home of the plant is Asia. 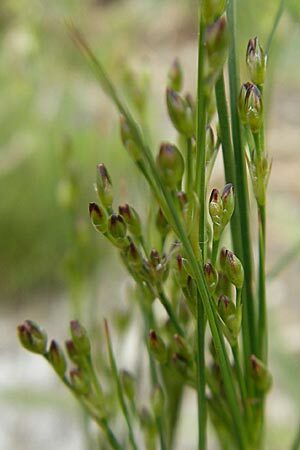 The Slender Rush Juncus tenuis, which has been introduced from the eastern part of America, is not rare. At the Gaisberg above Heidelberg the Spurge Laurel Daphne laureola might have been introduced about hundred years ago when foreign trees were planted for the Arboretum. 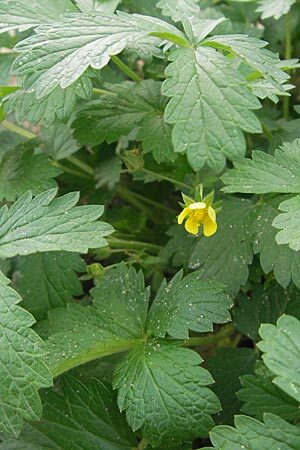 In the Exotenwald (forest of foreign trees) at Weinheim Japanese Avens Geum japonicum is growing together with the native Wood Avens Geum urbanum. 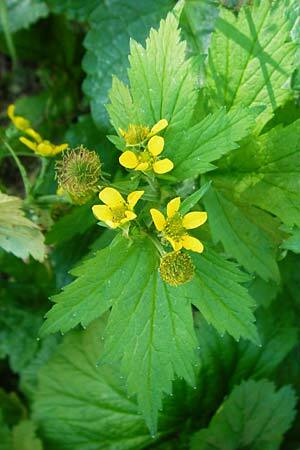 Geum japonicum has bigger leaves and a stocky inflorescence. 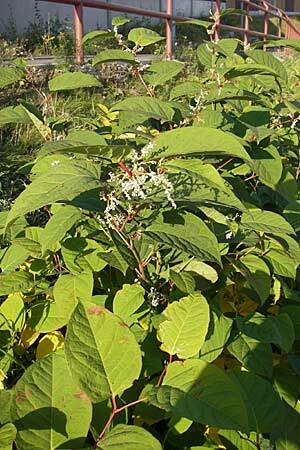 Imported garden bushes have run wild in the 'Kurpfalz', too. 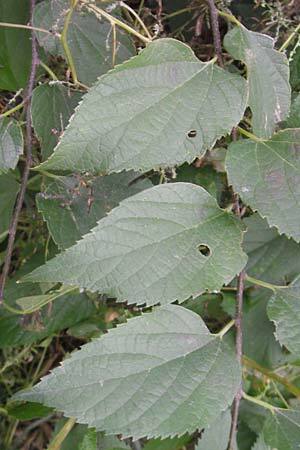 Many plants of Common Hackberry Celtis occidentalis can be found run wild at Karlsruhe, now I found it at Mannheim, too. 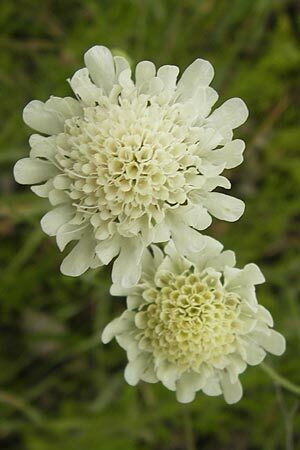 It originates from North America. 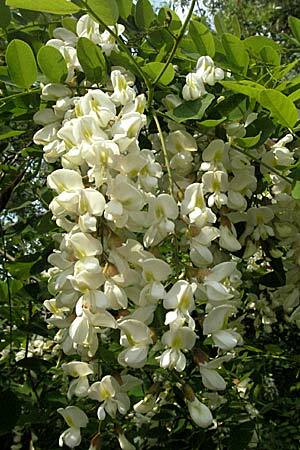 This tree, which comes from the Mediterranean and Western Asia, has run wild at the river shore of the Rhine at Ludwigshafen. 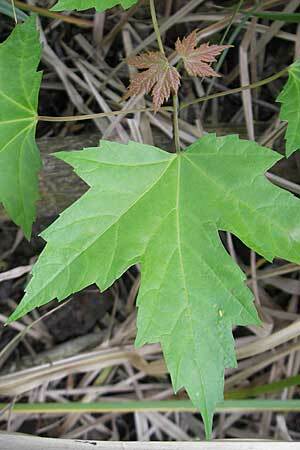 The bushes and trees of the next rows came from China and Eastern Asia, and ran sometimes wild on waste land, e.g. at railway stations. 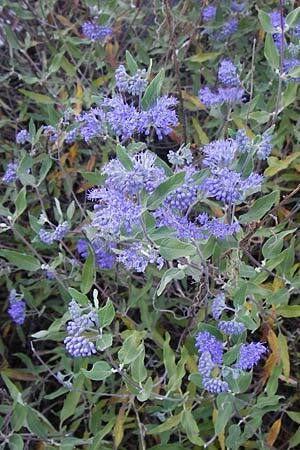 Buddlejaceae / Butterfly Bush Fam. 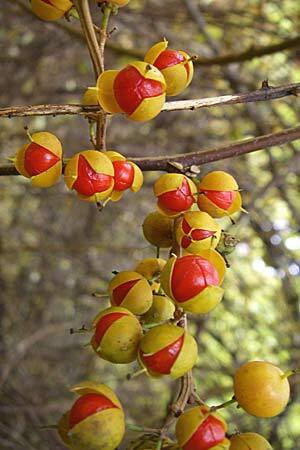 Sapindaceae / Golden-Rain Tree Fam. The bushes and trees shown in the next two rows have been imported from North America. Sometimes they run wild here. Very frequent at wood edges. 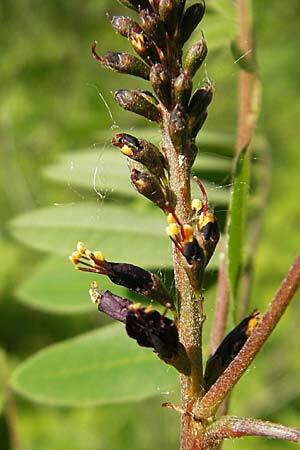 Desert False Indigo Amorpha fruticosa originates from North America. Found in Mannheim on the Friesenheimer Insel. A rather frequent bush, e.g. in the 'Viernheim Heide' northwest of Viernheim. 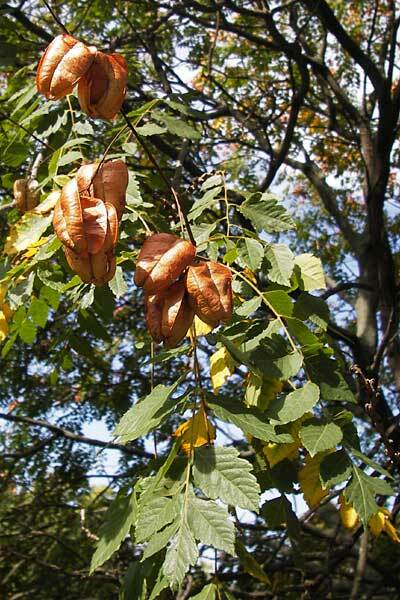 From eastern North America it was introduced as a tree for parks. It ran wild e.g. in a nature reserve at Hemsbach and along the Neckar near Mannheim. Valley, e.g. the Reissinsel at Mannheim, because it reproduces more and grows faster than e.g. 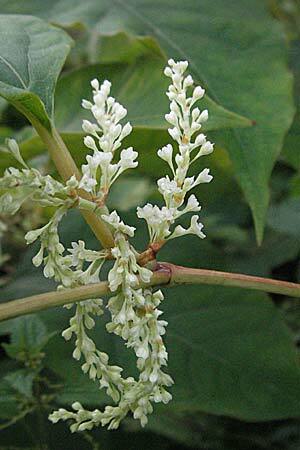 the native White Willow. 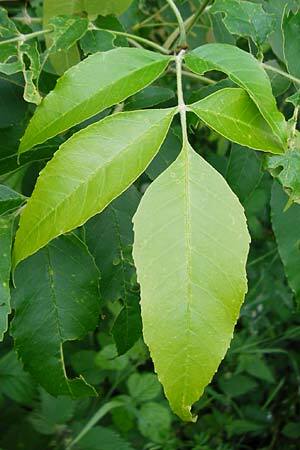 In nature reserve Kühkopf-Knoblochsaue the Green Ash had already to be combated, because it also grows faster than the native trees of riparian forests. 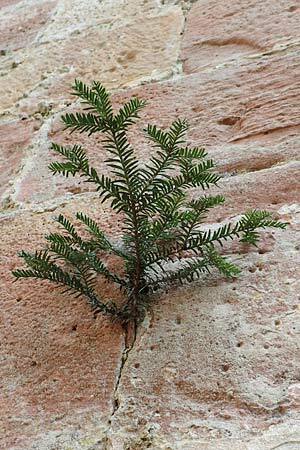 Also conifers as Yew or Oriental Arbor-Vitae are running wild out of seed which comes from planted trees. 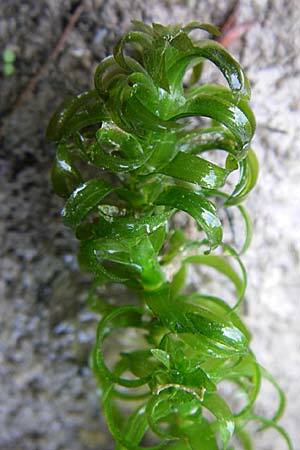 Azollaceae / Water Fern Fam. 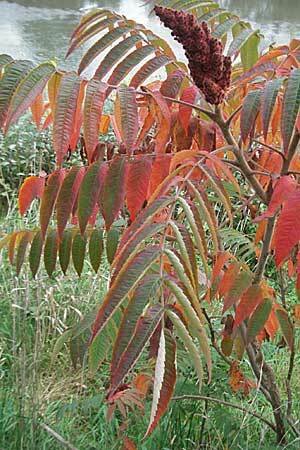 Naturally this list of neophytic plants of the 'Kurpfalz' can't be complete. It will be continued on occasion. 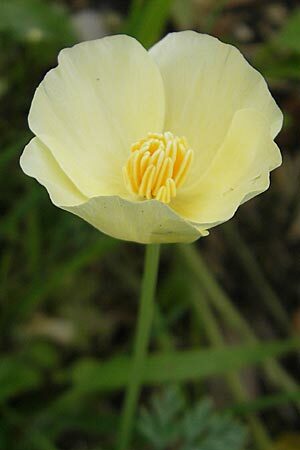 Information on the neophytes I took mainly out of the 8 volume book edition 'Die Farn- und Blütenpflanzen Baden-Wüttembergs' as well as from several web pages. Baden-Württemberg is the most south-western part of Germany. Some neophytes in North Rhine-Westphalia. Some neophytes in Northern Spain.